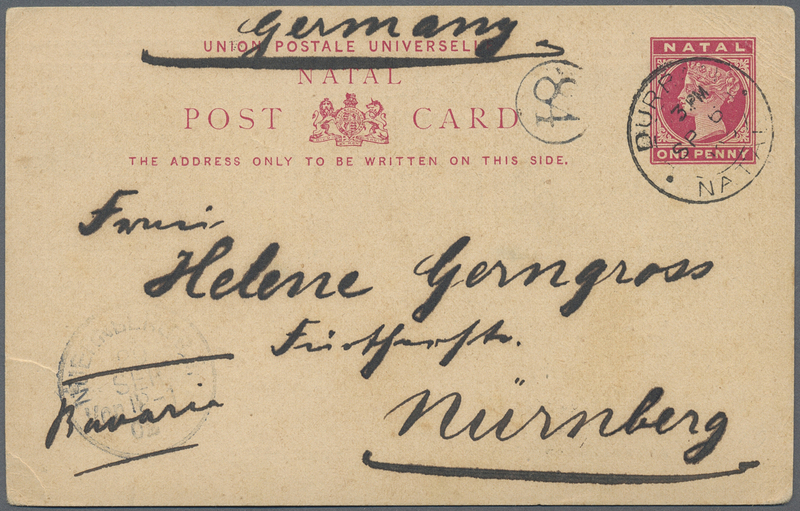 80040 Ganzsache (Complete) 1902, Natal. 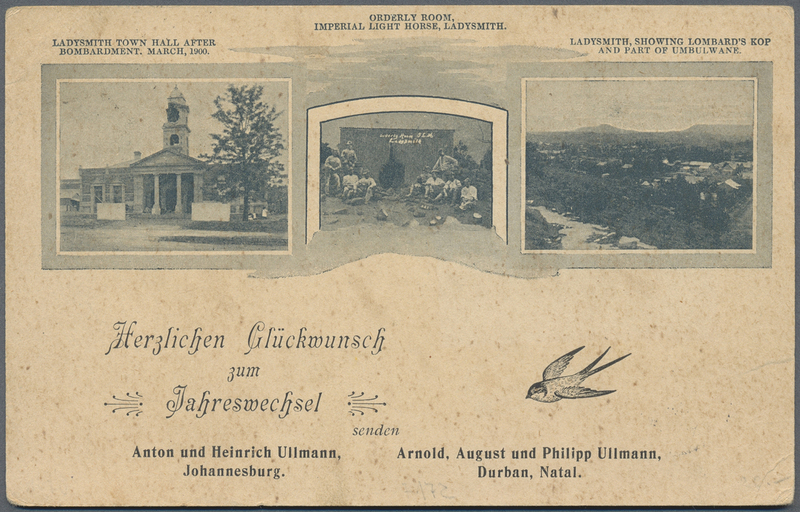 Picture entire postcard 1d with three detail pictures (English descriptions) on the reverse and German imprint "Herzlichen Glückwunsch zum Jahreswechsel ..." with a BIRD (flying swallow). 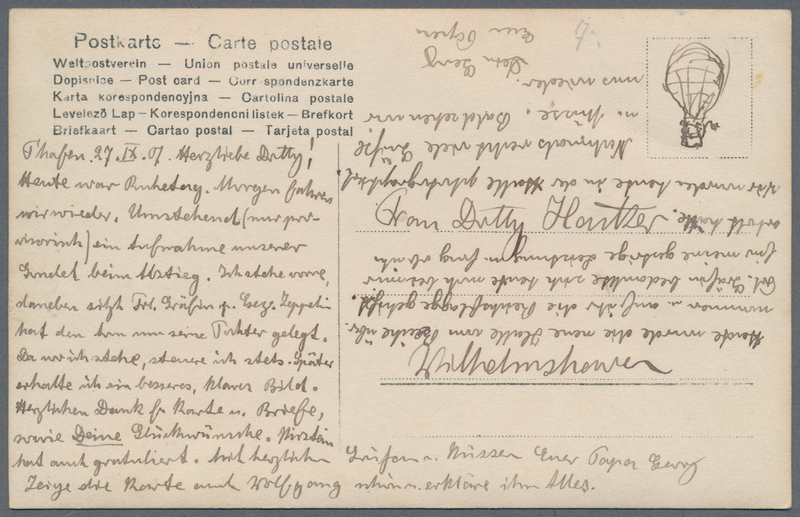 Used from "Durban" to Nürnberg. 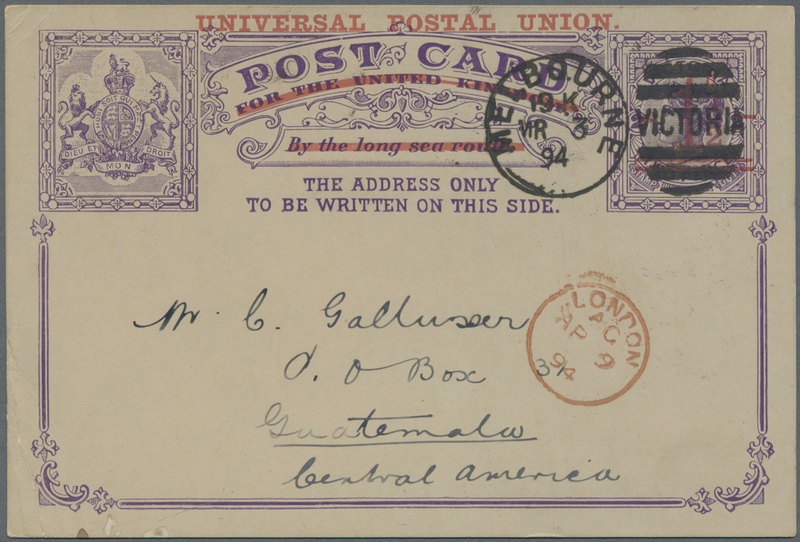 80042 Brief (cover) 1897, USA. 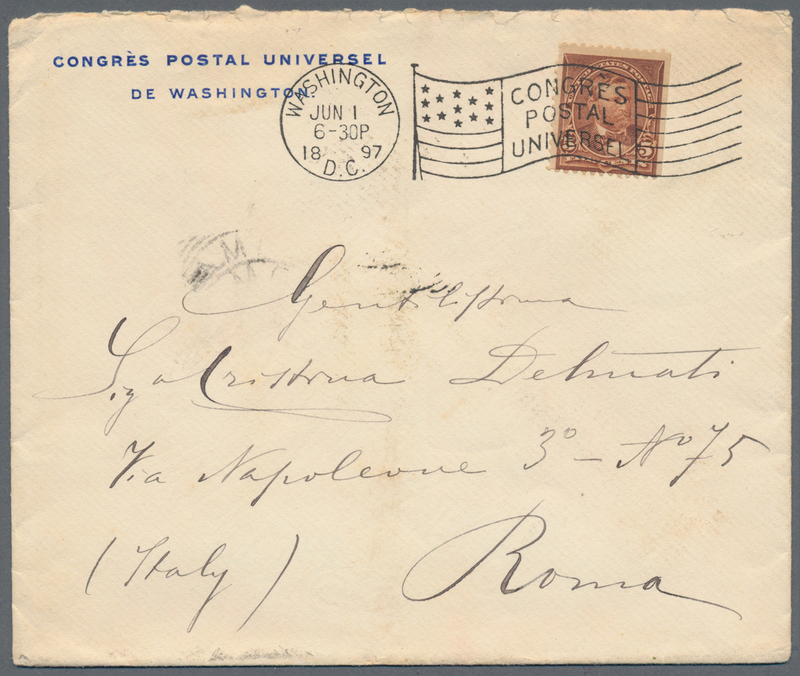 Pre-printed cover "Congres Postal Universel / De Washington" (size 147x123 mm) sent with special flag cancel "Congres / Postal / Universel" from "Washington 1.6.1897" to Italy. 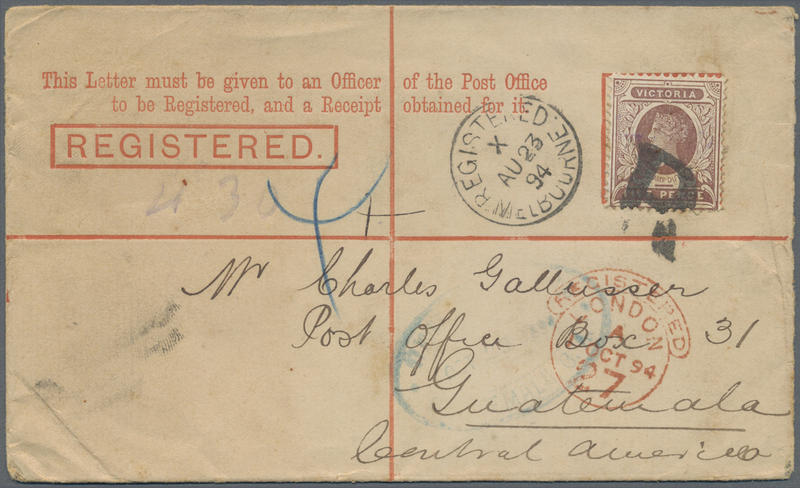 80043 Brief (cover) 1897, USA. 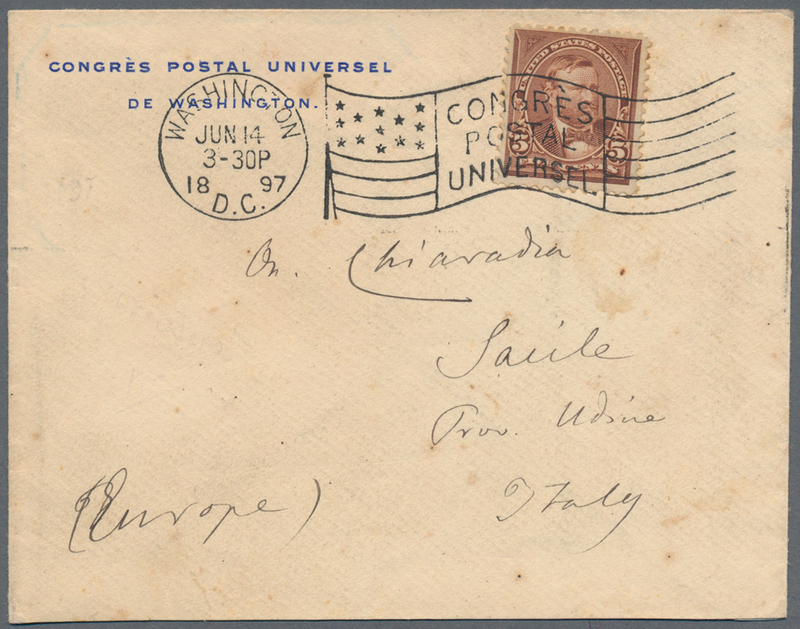 Pre-printed cover "Congres Postal Universel / De Washington" (size 117x92 mm) sent with special flag cancel "Congres / Postal / Universel" from "Washington 14.6.1897" to Italy. 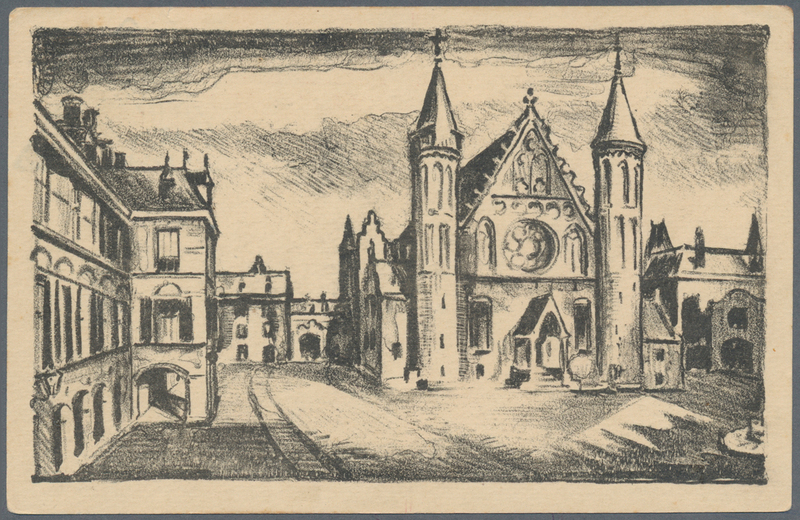 80044 Ganzsache (Complete) 1927, illustrated stationery cards 5 Cent (2) and 10 Cent (2), official emission of the Dutch Post as a gift to the foreign members of the "INTERNATIONL AIRMAIL CONFERENCE THE HAGUE 9.11.1927. 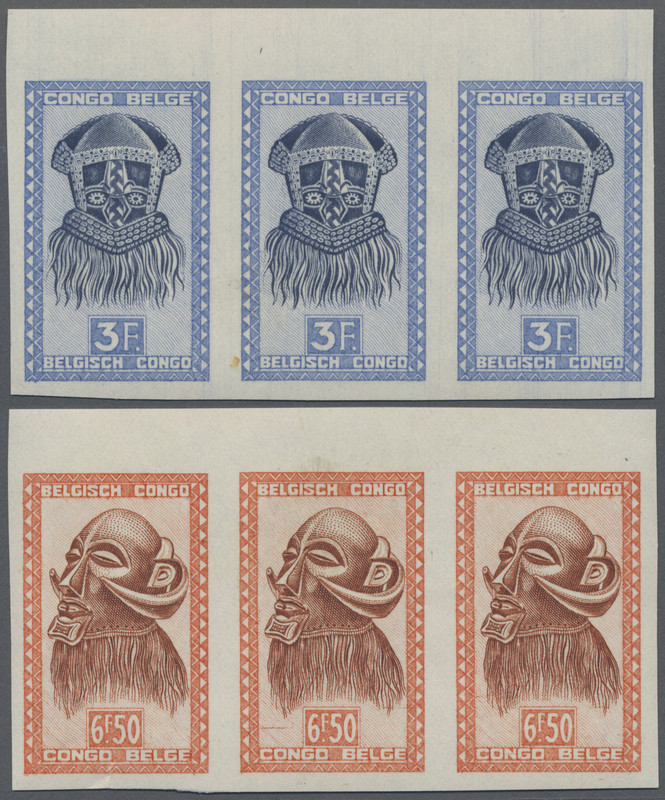 Only 200 complete sets issued. 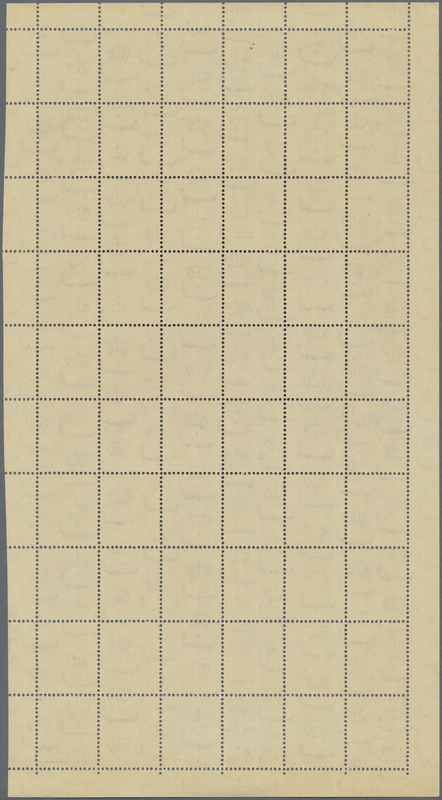 Extremely rare set. 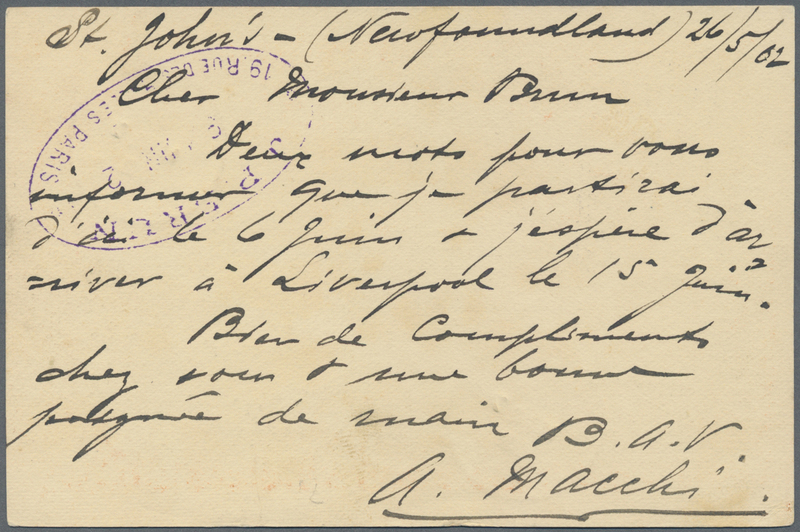 80045 Brief (cover) 1907, HACKER, GEORG: erster Zeppelinkapitän auf LZ 3 (Z I). 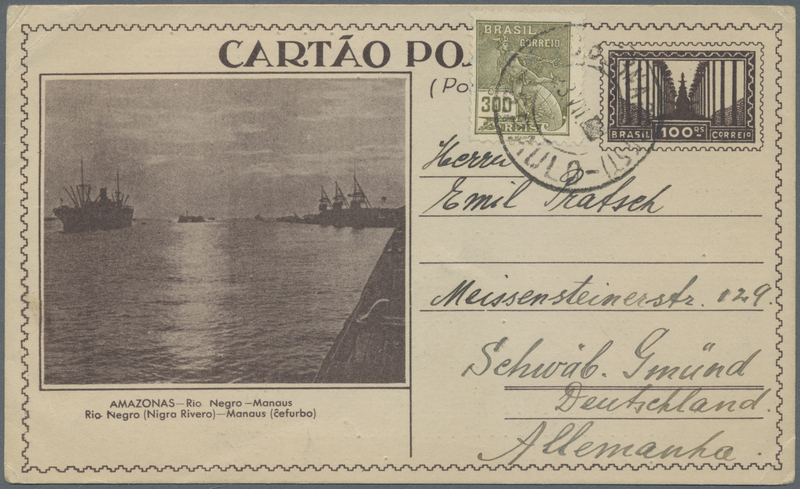 Postkarte "mein Luftschiff" mit eigenhändig verfasstem Bericht vom 6.9.07, dem Tag seines Dienstantritts bei Graf Zeppelin. 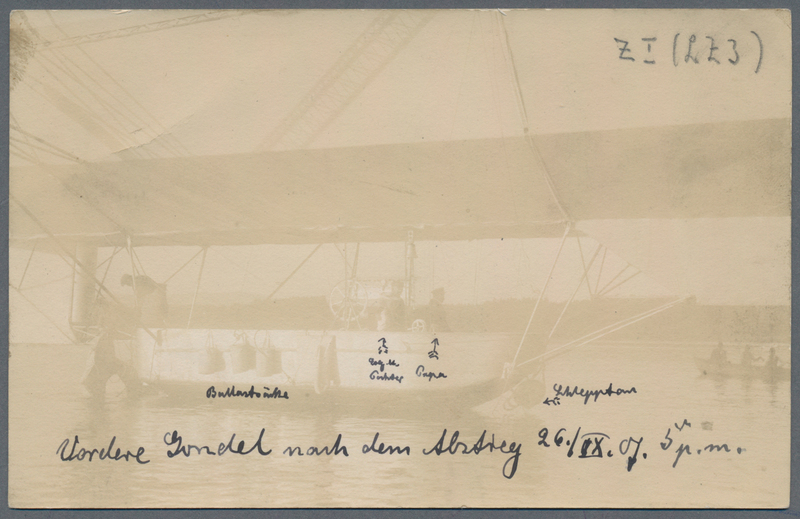 80046 Ansichtskarte (Picture postcard) Si I B 1909, LZ 3 (Z I), Ansichtskarte "Vordere Gondel nach Abstieg, 5 Uhr nachmittags", Eng von Georg Hacker beschriebee Fotokarte. 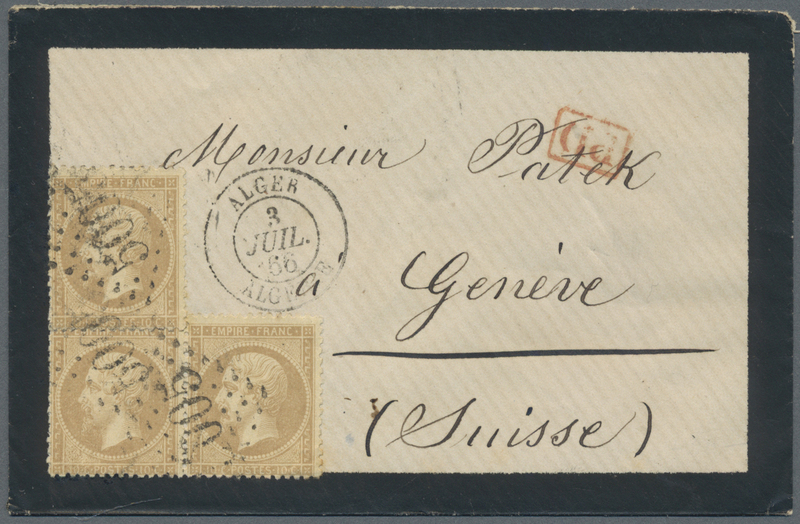 80048 Brief (cover) 119 (3>), 144 1932, registered letter from "ALEXANDRIA 14 III 32" to Berne, Switzerland. 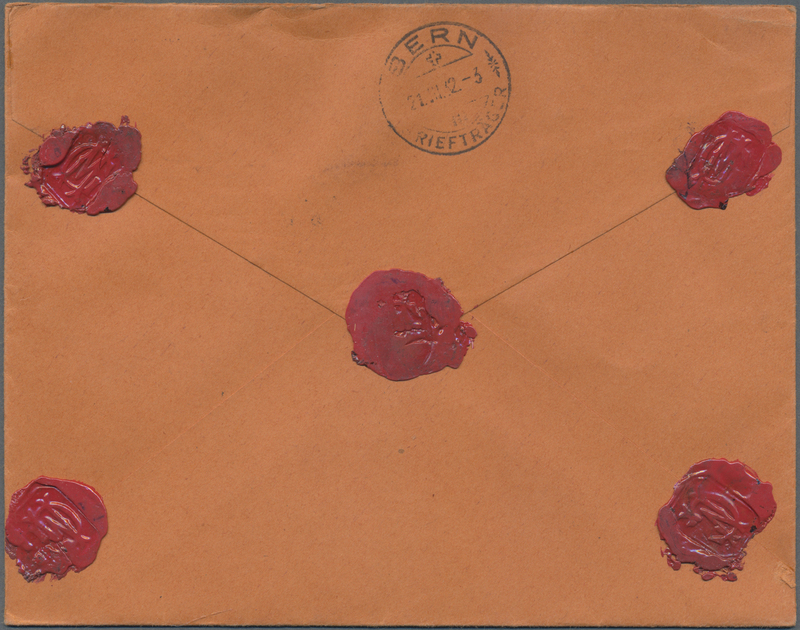 Five intact seals on back. 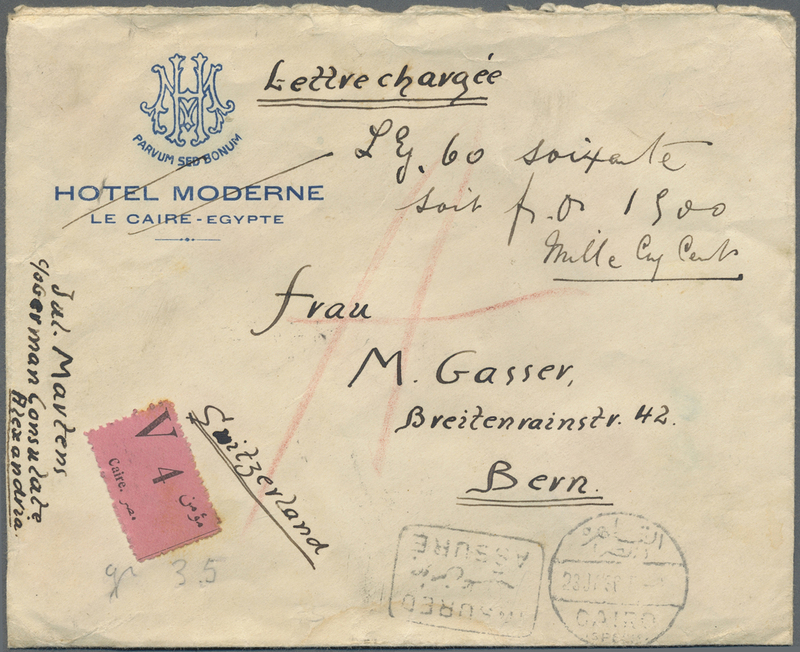 80049 Brief (cover) 123 (2),131,13,134 1936, sealed insured letter from CAIRO 23.1.36 franked on reverse with King Fuad 4 M (2, one corner defect), 20 M, 50 M and 100 M sent to Berne via Udine and Venezia. 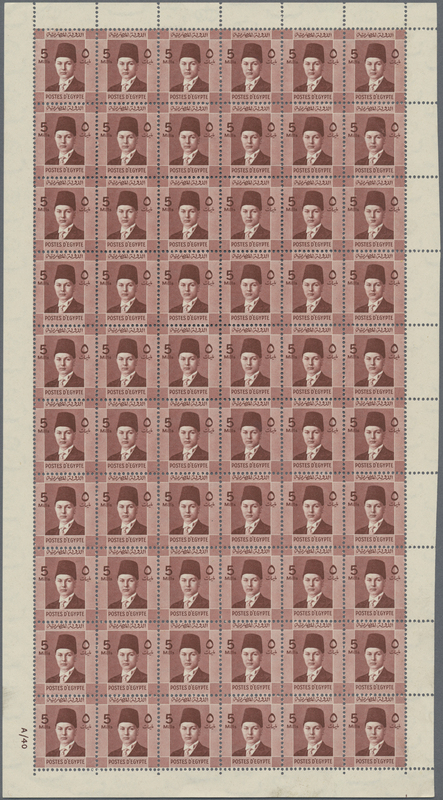 80050 postfrisch (never hinged) ** 227(60), 228(60) 1937-40 'Young King Farouk' 5m. 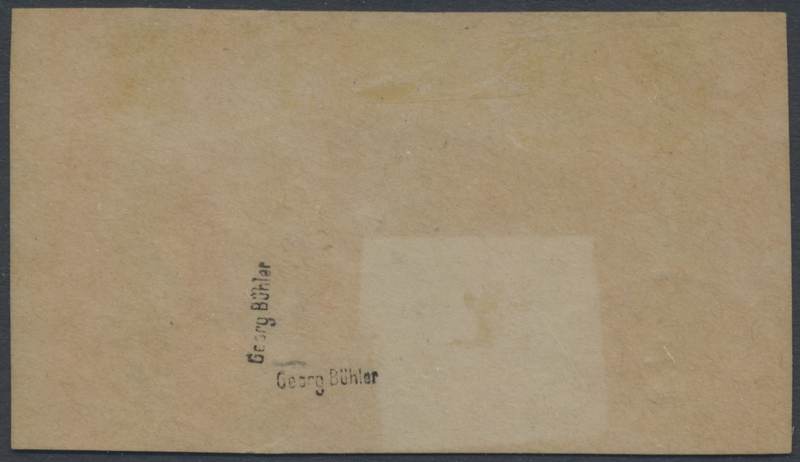 and 6m. 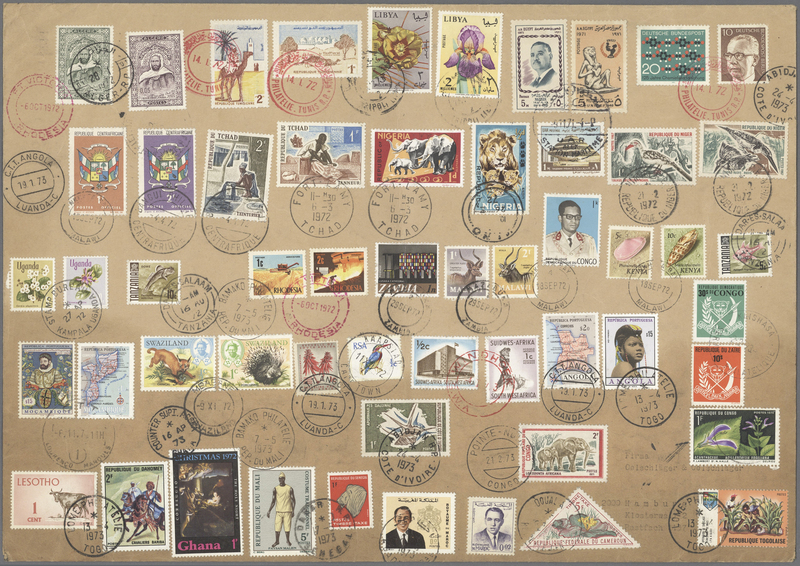 each as complete uncut booklet sheet of 60 (10 rows of 6), mint never hinged, fresh and fine. 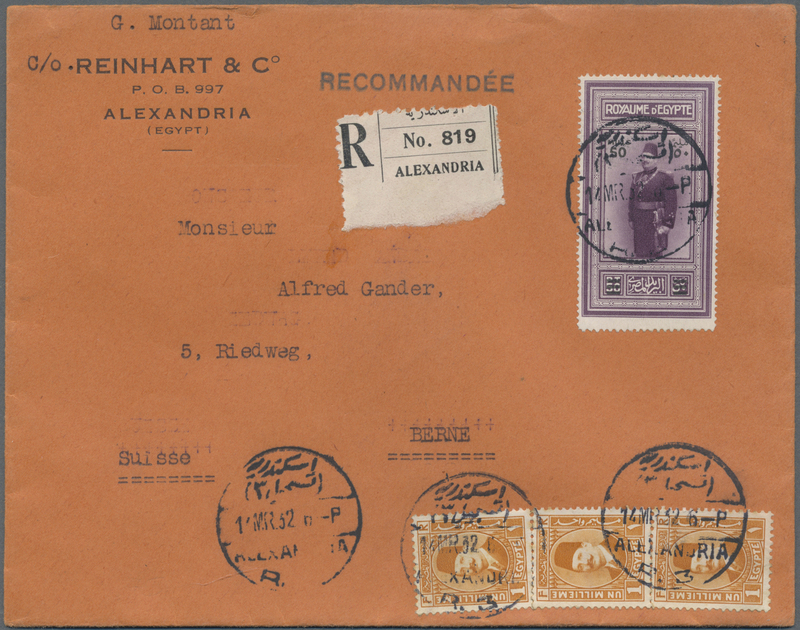 80051 Brief (cover) 1948 '1st Arab-Israeli War' cover from Cairo to 1st Regiment in Palestine, located at El Maidal (Gaza) with fine double strike of octagonally framed 'Field Post Office No. 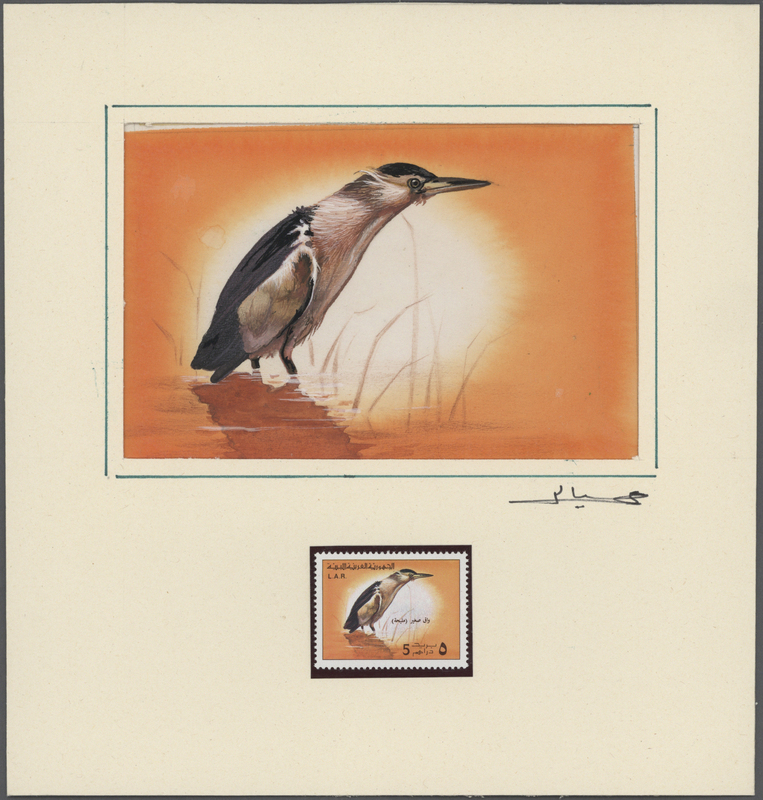 4' handstamp in blue. 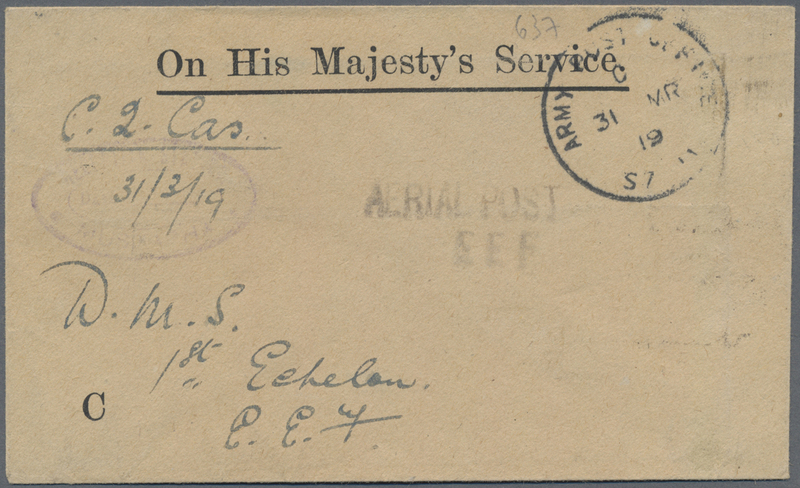 80054 Brief (cover) 1919 (31 May), Official cover from Army/Field Post Office in Egypt addressed to '1st Echelon, E.F.F.' 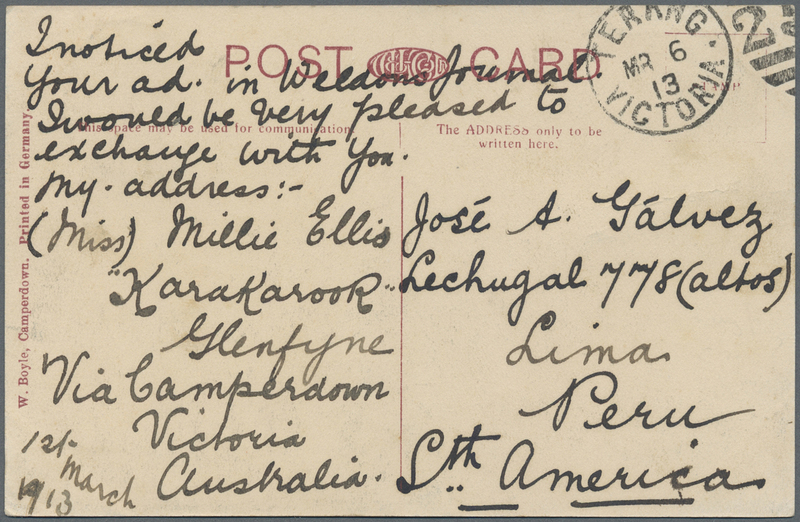 in Jerusalem, with Army P.O. 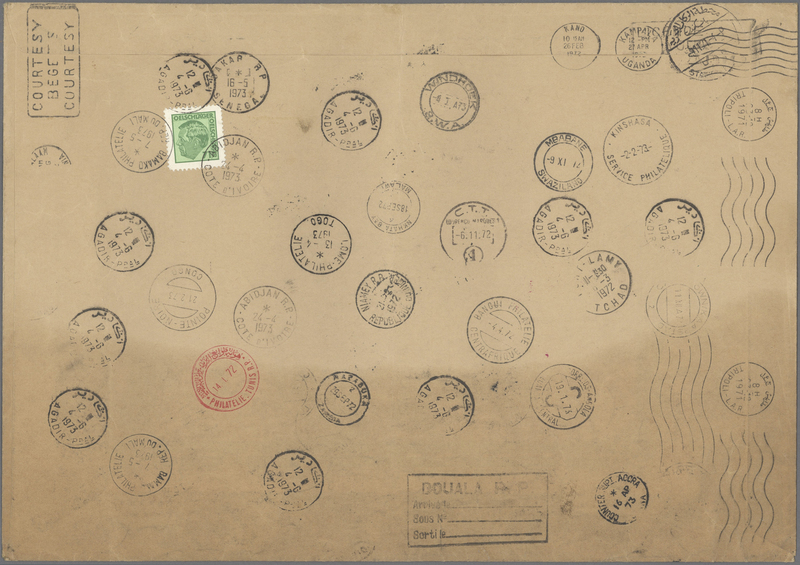 '31 MY 19' despatch cds, weak strike of sender oval h/s and two-liner "AERIAL POST/E.E.F." 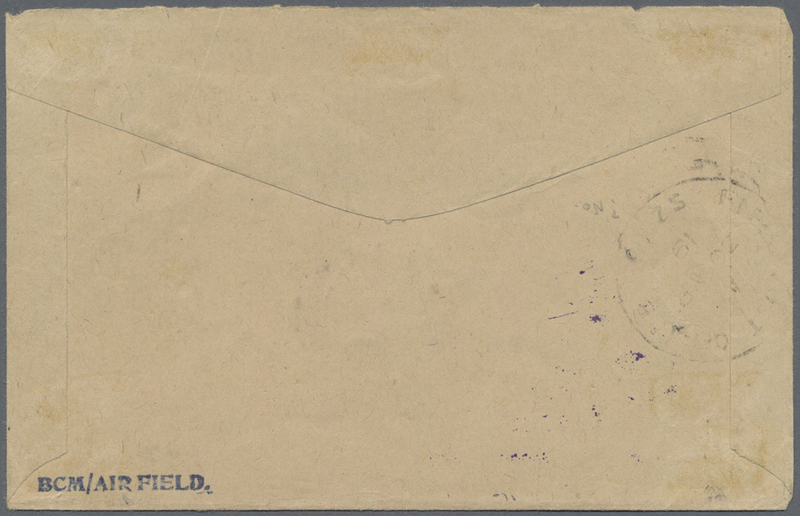 on face, Field P.O. 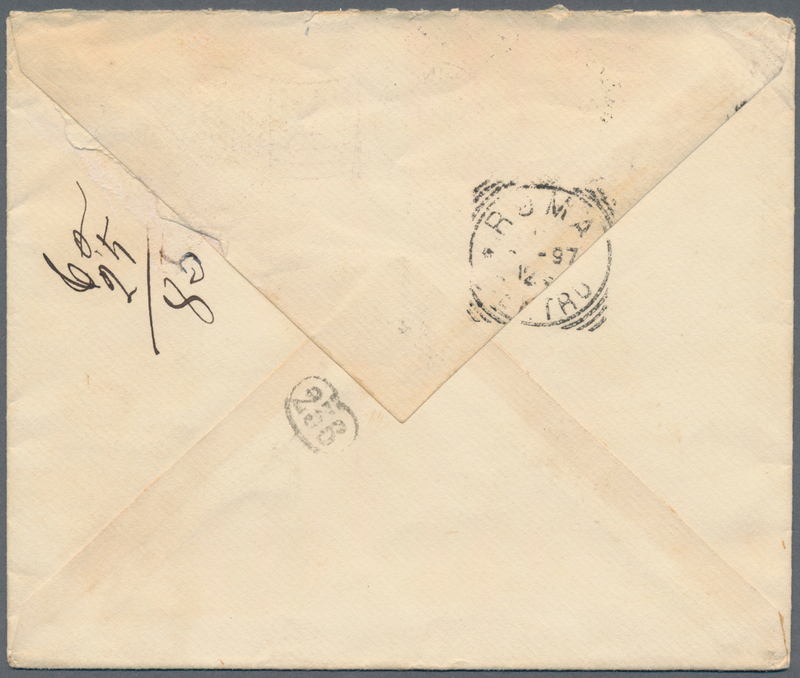 cds on the reverse. 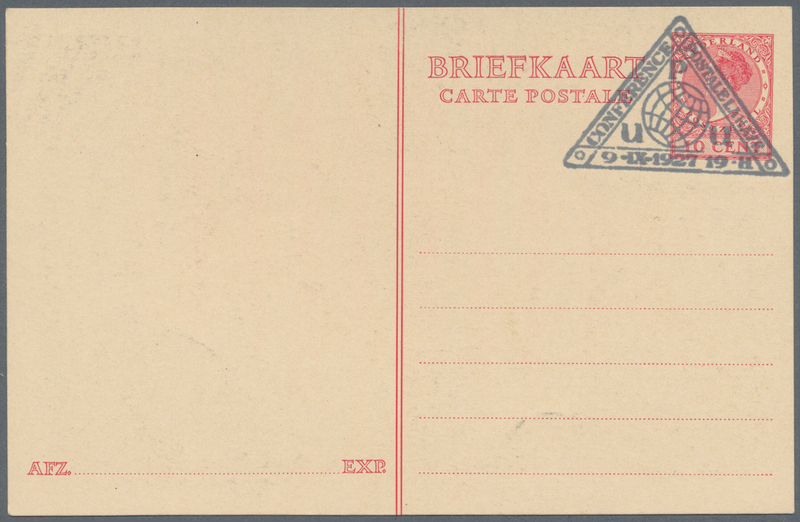 80055 Brief (cover) 1919 Pioneer E.E.F. 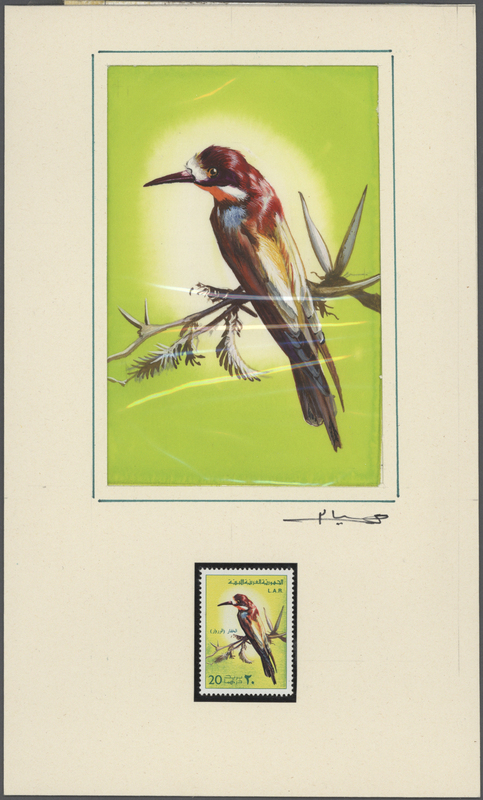 Emergency Flight: Official cover to Abbassia (Cairo) bearing DOUBLE HAND-STAMP "AERIAL POST/E E F", with framed "3rd. 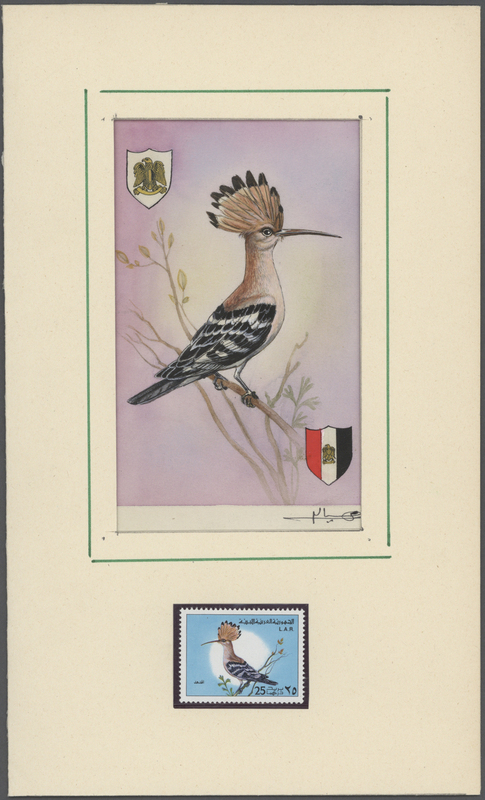 ECHELON/EGYPTIAN EXPDY FORCE/No.2 RECORDS/SECTION/G.H.Q. 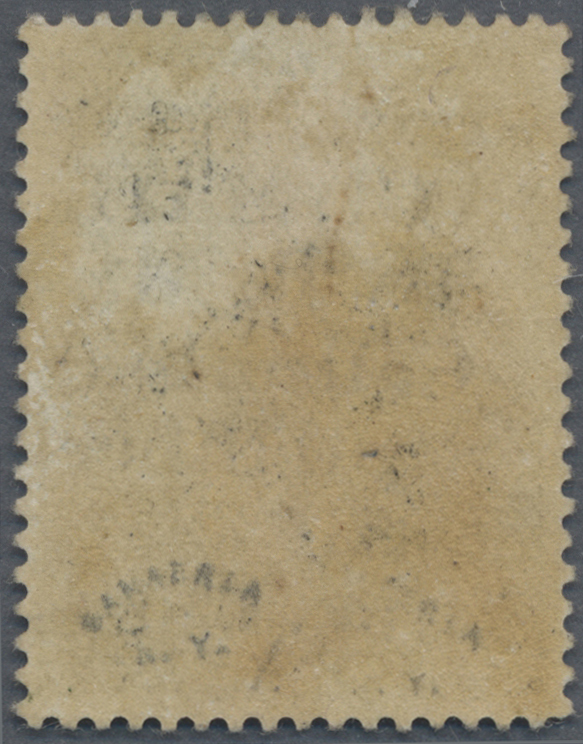 Base Egypt" handstamp as well as Army P.O. 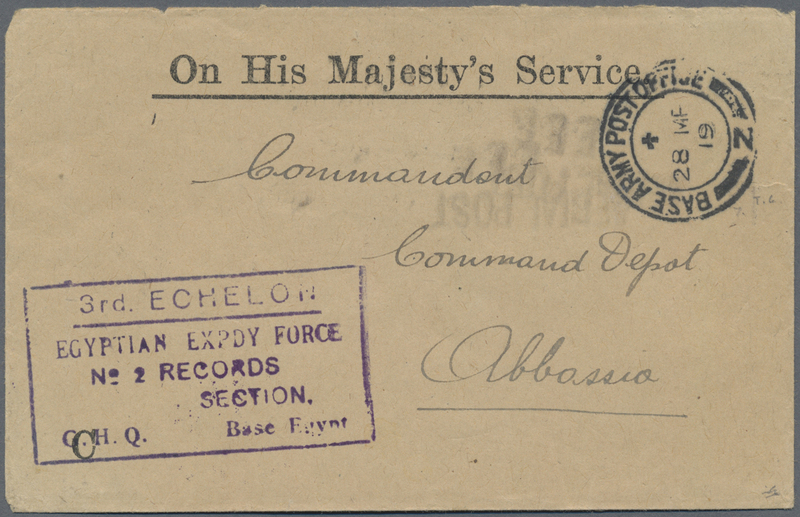 '28 MR/19" cds on front, Cairo '30 March' arrival cds on the reverse, fine and scarce. 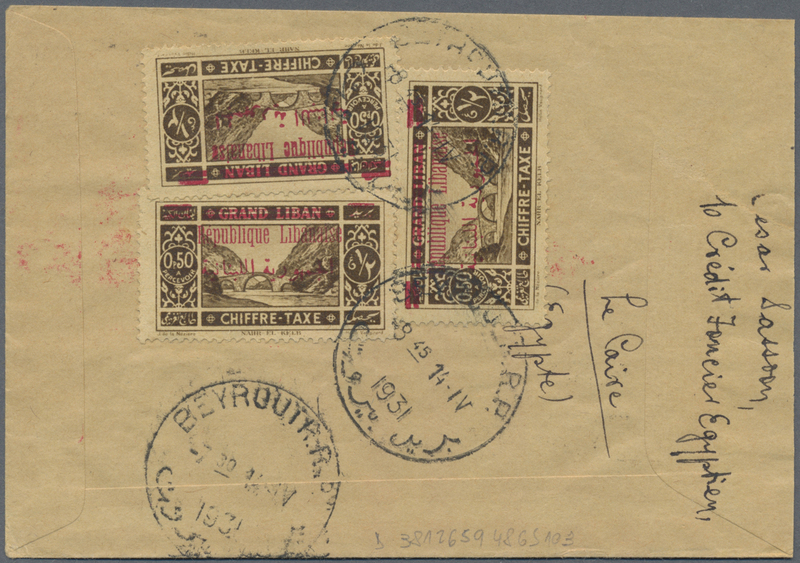 80056 Brief (cover) 156+157 and Lebanon 1931 (10th Apr. 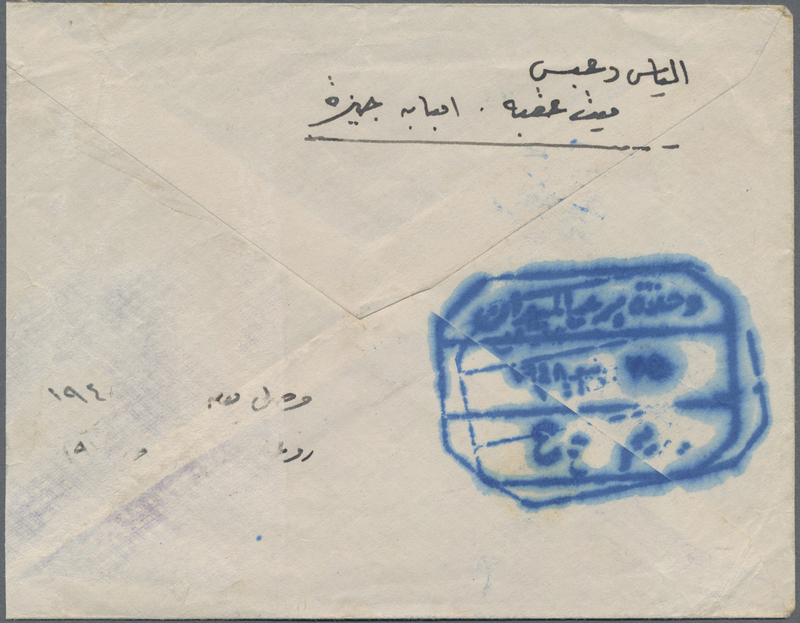 ), Zeppelin cover from Cairo to Beyrouth flown from Cairo to Palestine, franked by Egyptian Zeppelin stamps 50m. on 27m. and 100m. on 27m. 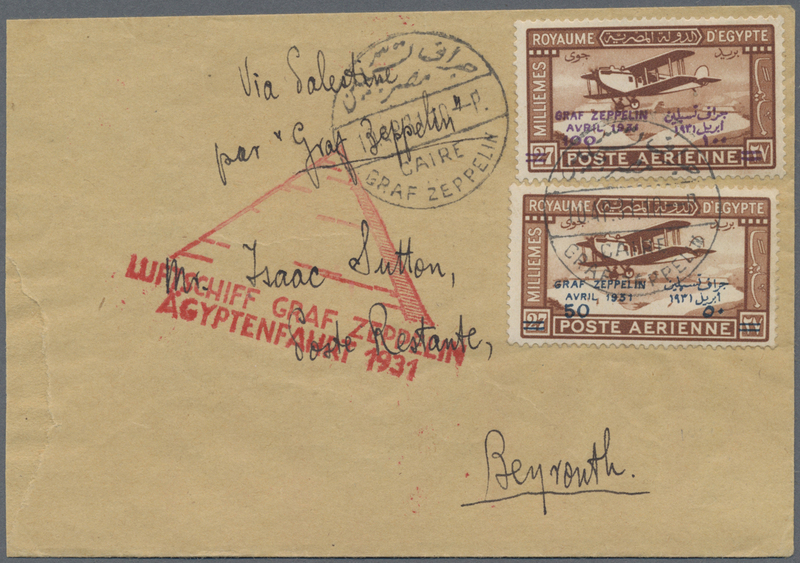 tied by 'Cairo Graf Zeppelin' cds, with "Luftschiff Graf Zeppelin/Ägyptenfahrt 1931" cachet in red alongside, and on the reverse with three Lebanese postage due stamps 0,50p. 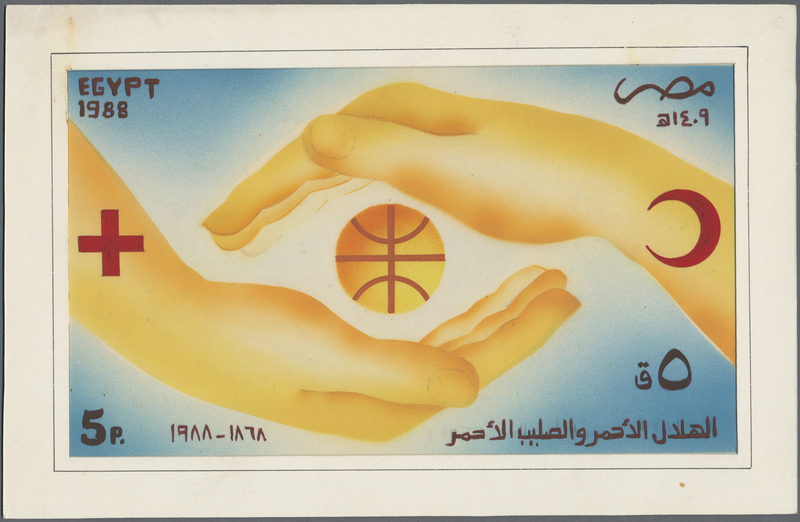 tied by Beyrouth R.P. 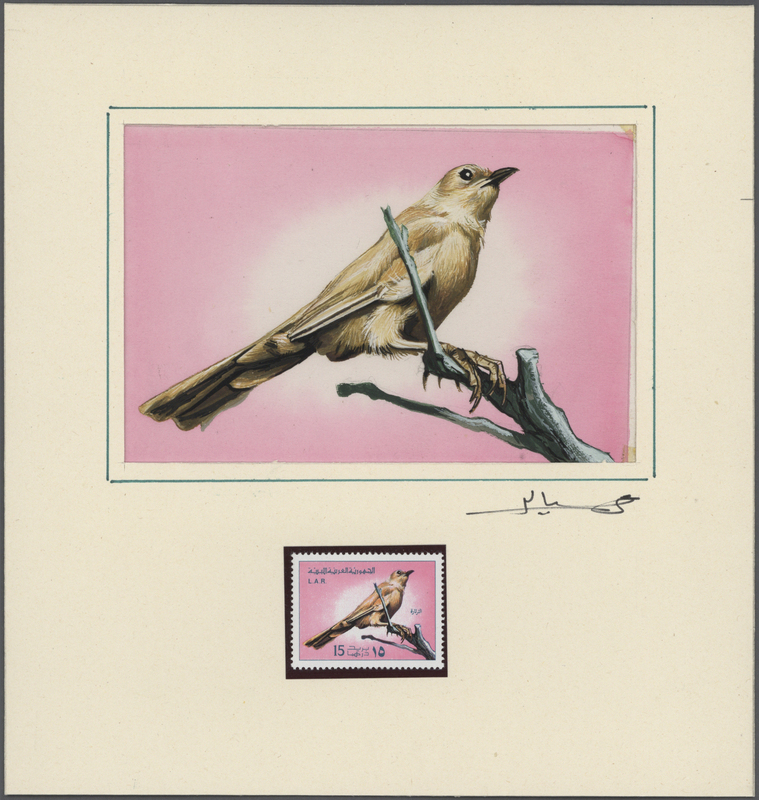 '14.IV.31' arrival cds, fine. 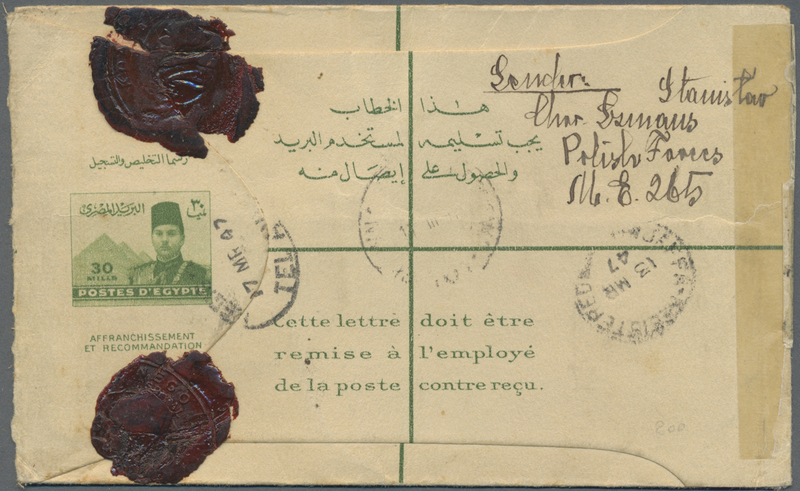 One of only two recorded covers addressed 'Poste Restante' to Lebanon. 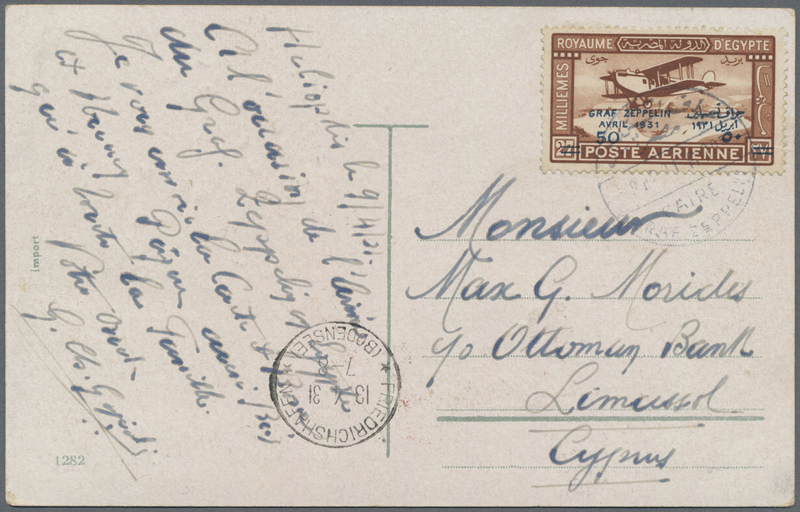 80057 Brief (cover) 156 1931 Destination CYPRUS: Zeppelinstamp 50m. 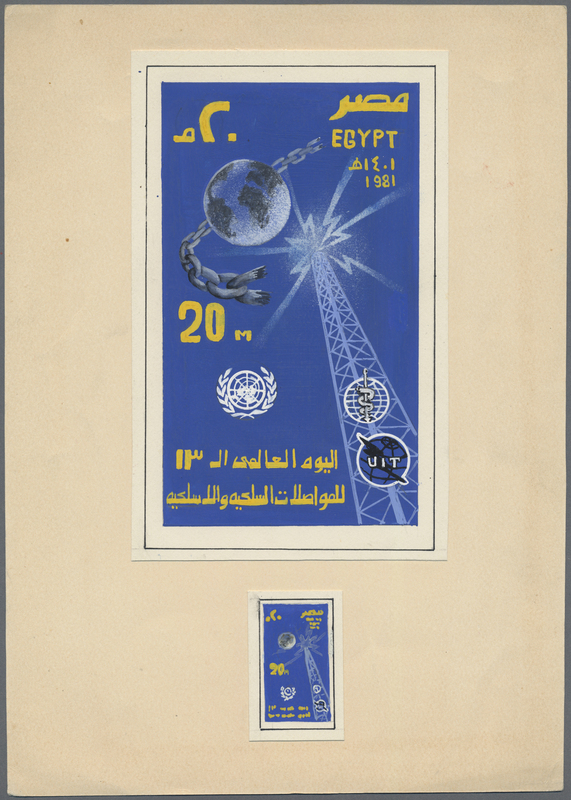 on 27m. 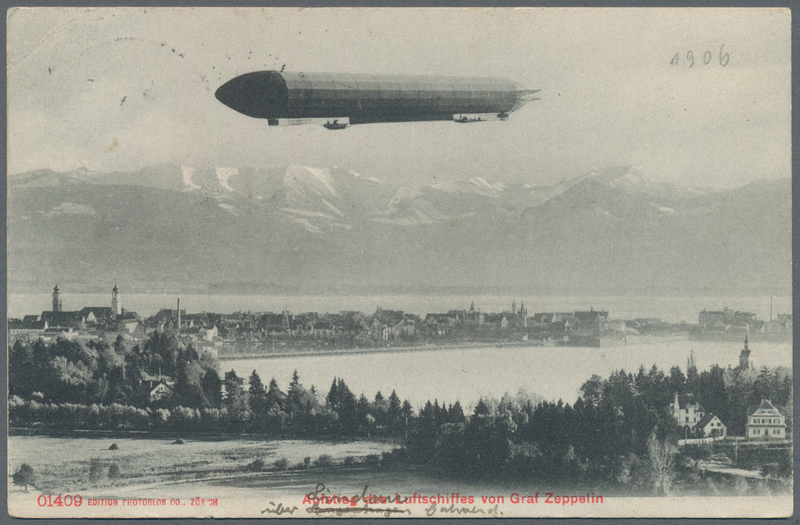 used on picture postcard from Cairo to Limassol, Cyprus flown by Zeppelin to Friedrichshafen, with bilingual 'CAIRO/GRAF ZEPPELIN' cds and Freidrichshafen '13.4.31' arrival cds, fine. 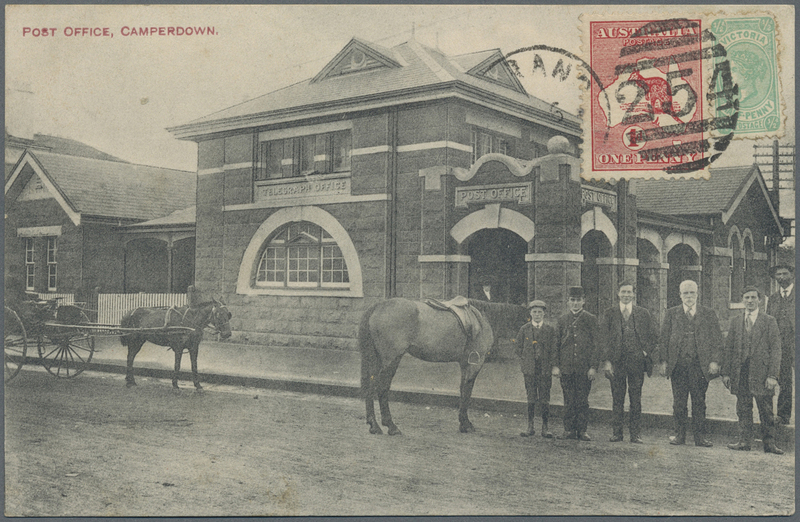 A scarce destination. 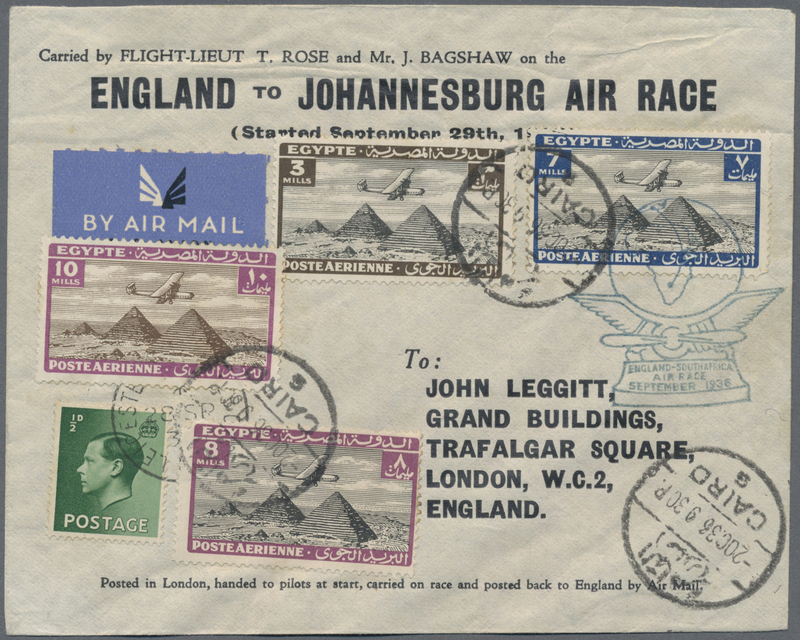 80058 Brief (cover) ex 166/173 + GB 1936 England to Johannesburg Air Race cover flown by Rose & Bagshaw to Cairo, where their plane was damaged, and sent back to England, franked by 1933 Air stamps 3m., 7m., 8m. and 10m. 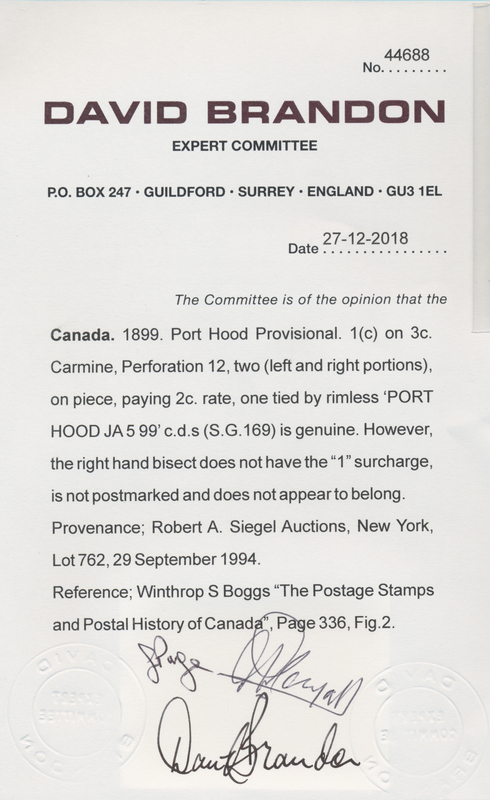 for correct 28m. 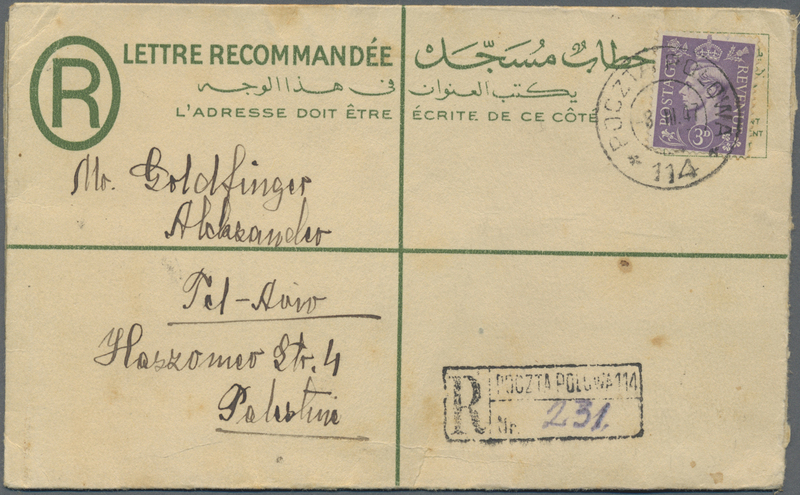 rate, tied by bilingual Cairo '2 OC 36' cds, and additionally franked by GB ½d. 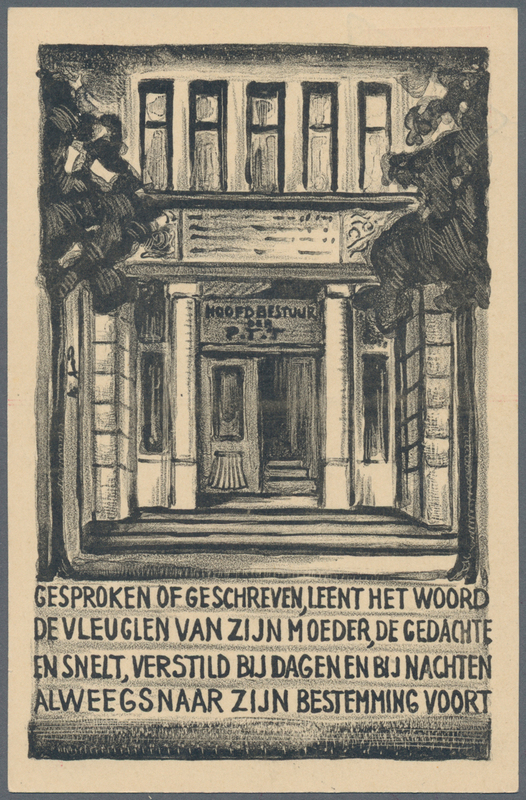 at arrival at 28th Sept. 1936. 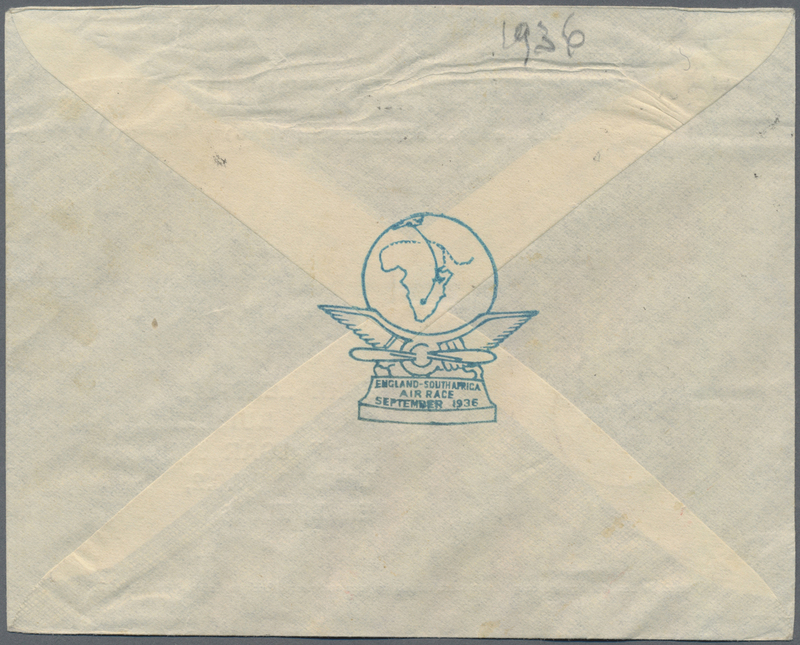 80059 Ganzsache (Complete) Ascher 8 1947, egyptian registered 30 M stationery envelope with additional british 3 d stamp used by Polish Forces field post number "114" to Tel-Aviv. 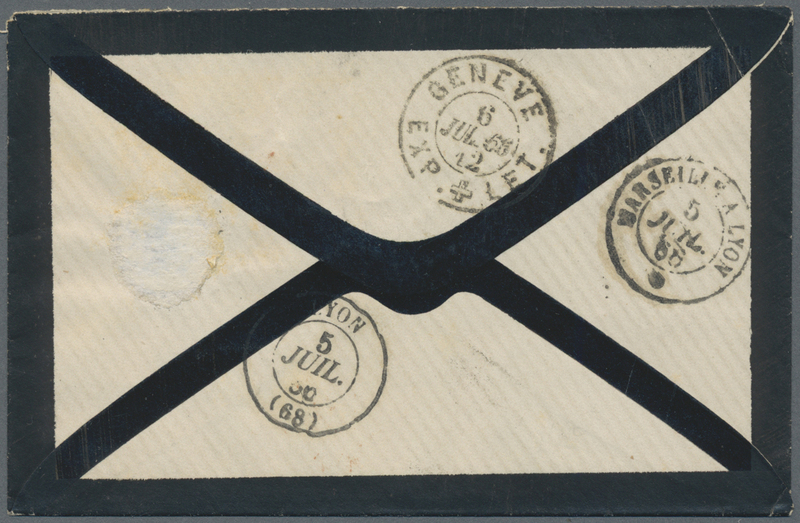 80060 Brief (cover) FR 2 (3) 1866, mourning covver franked with 3 pieces 10 C Napoleon from "ALGER 3 JUL 66" to Geneva Suisse. Very fine. 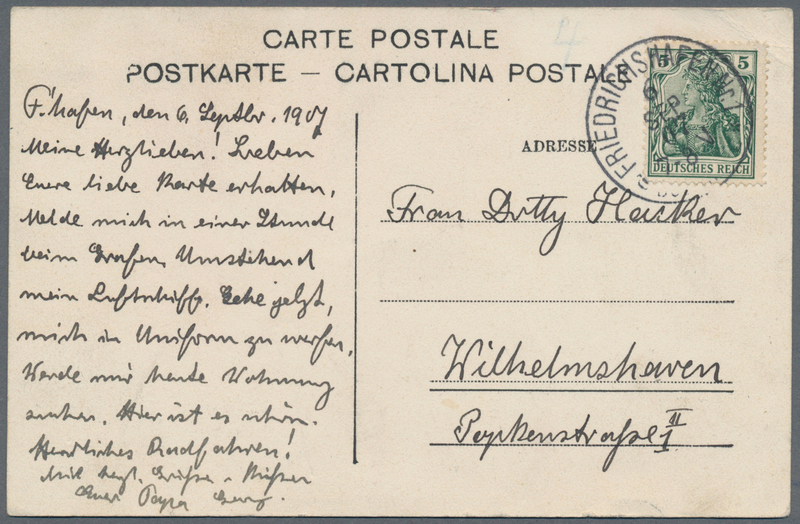 80061 postfrisch (never hinged) ** 1926 (ca). 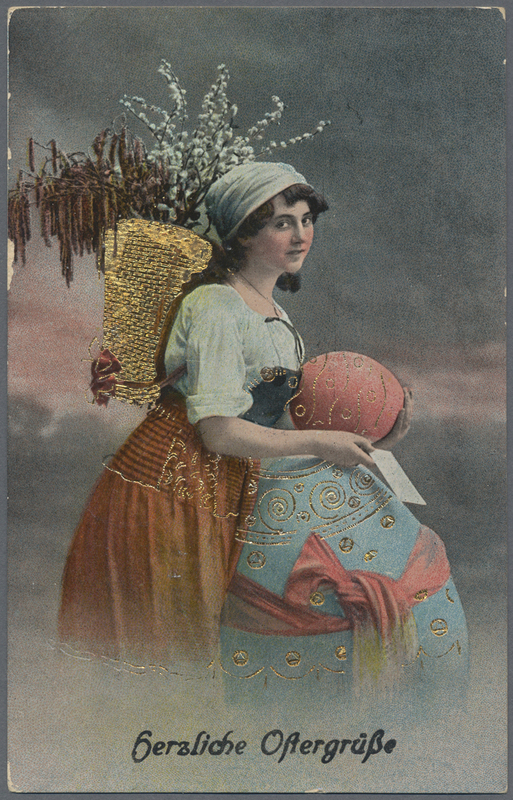 Booklets. 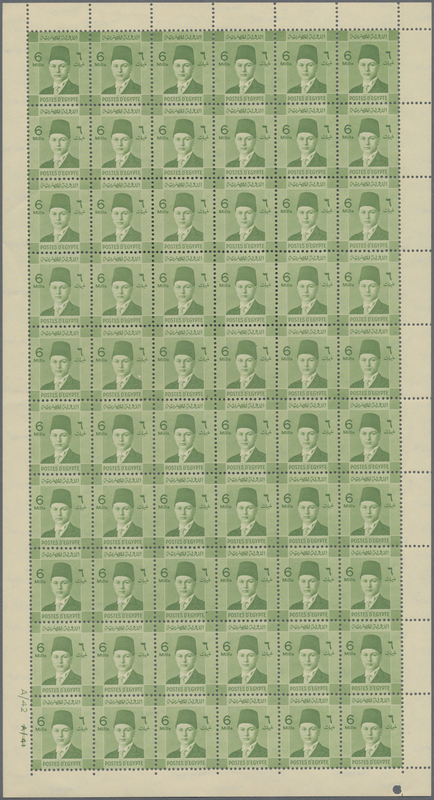 50 cred fishery mosque, block of 40 with marks, beginning of cutting (may be the only one known), booklet not made. 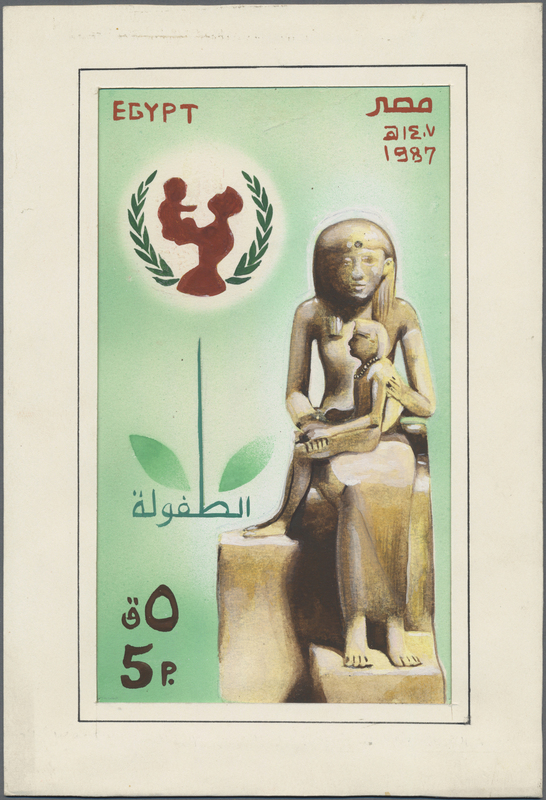 ÷ 1926 (ca). 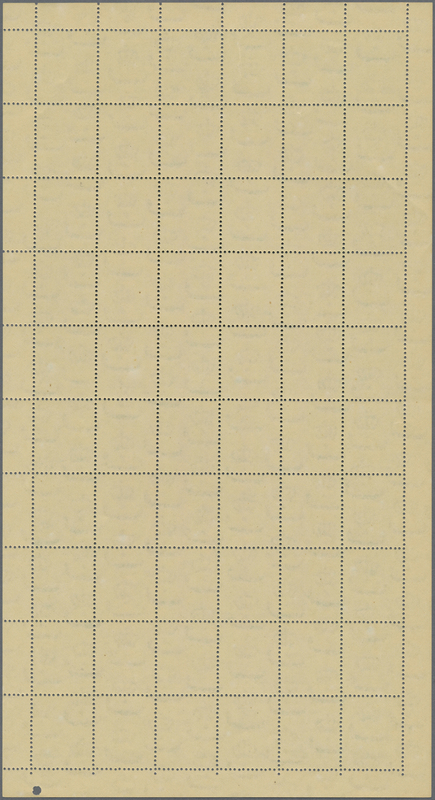 CARNETS. 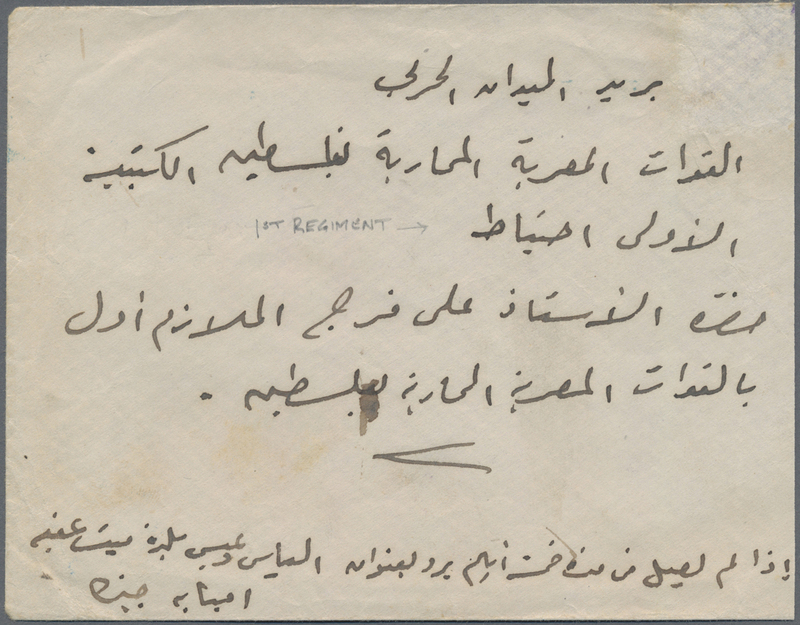 50 c rouge Mosquée de pêcherie, block de 40 avec marques, débuts de découpe (peut être le seul connu), carnet non cpnfectionnés. 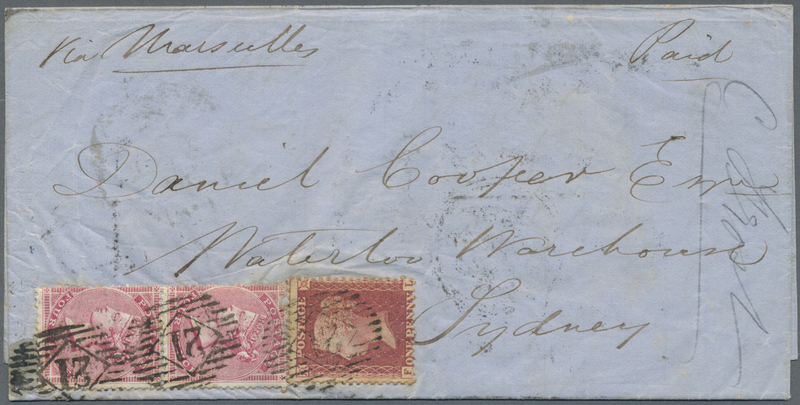 80063 Brief (cover) SG 17, 66 (2) 1858, complete folded letter franked with 1d and 4 d rose (2) from LONDON with numeral cancellation "21" via Marseille to Sydney, New South Wales. 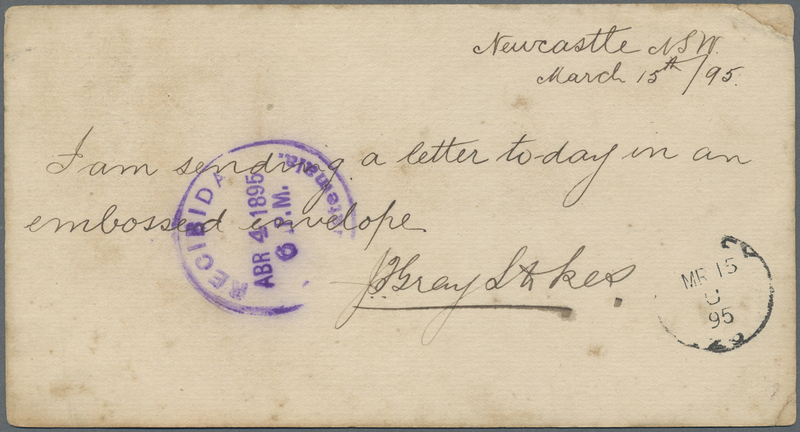 80064 Ganzsache (Complete) Ascher 13 A 1895, 1 1/2 d stationery card from NEWCASTLE 15.3.95 via SAN FRANCISCO to Guatemala. Rare destination. 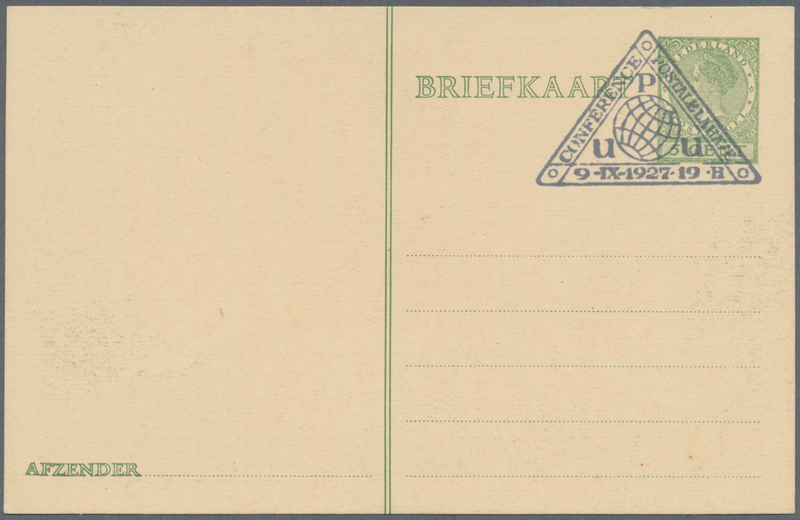 80065 Brief (cover) SG 78, 81 1859, 3d. blue and 1s. 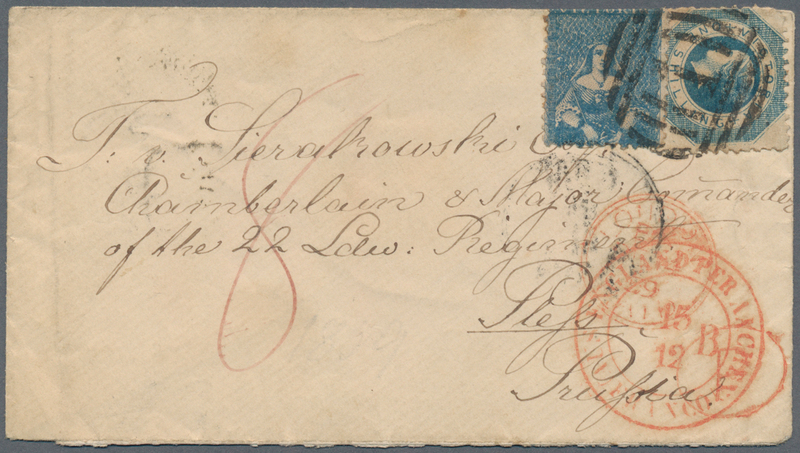 blue on cover from Melbourne to "T.v.Sierakowski Chamberlain & Major Commander of the 22 Regiment" in Pless/Prussia (today Pszczyna/Poland), oblit. 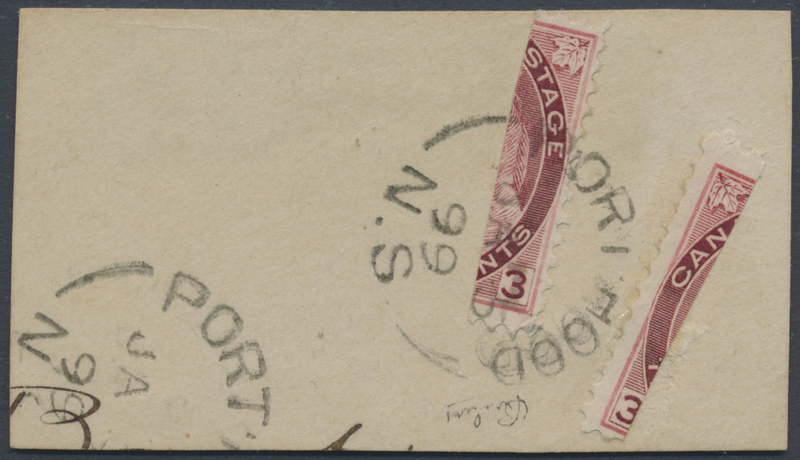 by numeral "1" and backstamped "MELBOURNE OC 17 59", on front red London and Aachen 15.12. transits, arrival mark 17.12. on reverse, 3d. 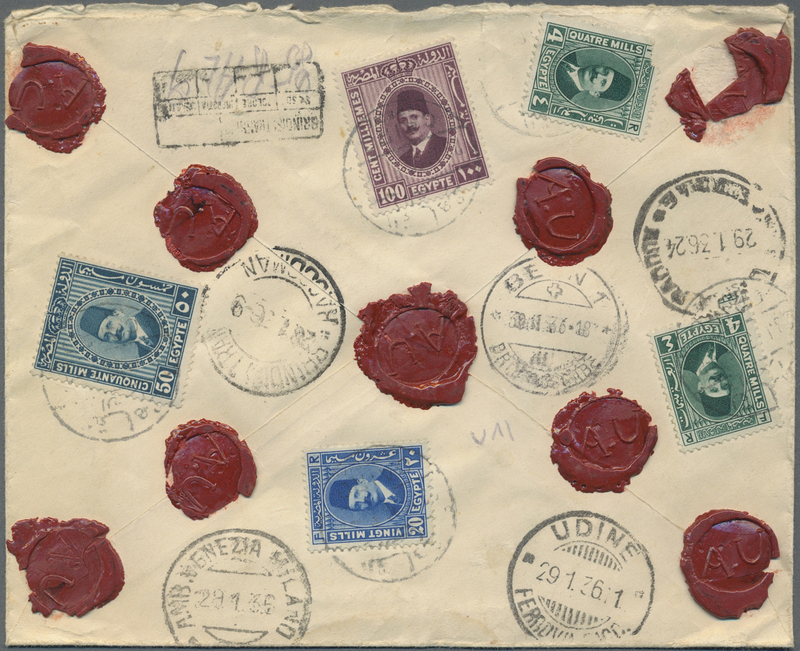 adhesive misperforated and attachend "over edge", stamps and cover showing some usual postal wear. 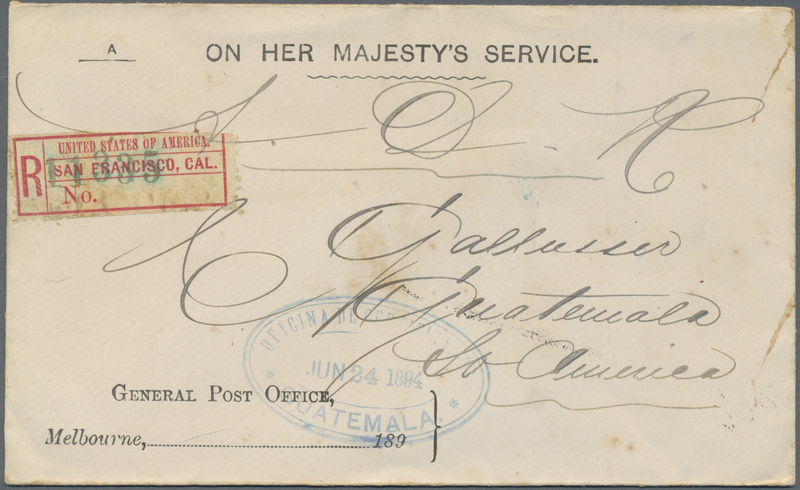 80066 Ganzsache (Complete) 1894, unfranked official service cover "ON HER MAJESTY´S SERVICE" sent registered from General Post Office Melbourne with registration label of SAN FRANCISCO to Guatemala. 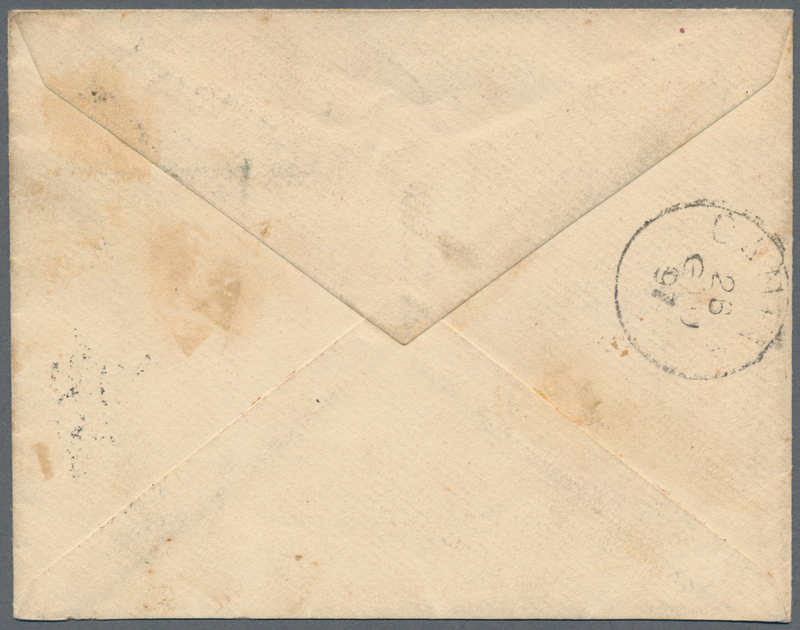 80067 Ganzsache (Complete) Ascher 8, SG 317 1894, registered stationery envelope uprated by 5 Pence QV brown sent from "MELBOURNE AU 23 94" via London to Guatemala. 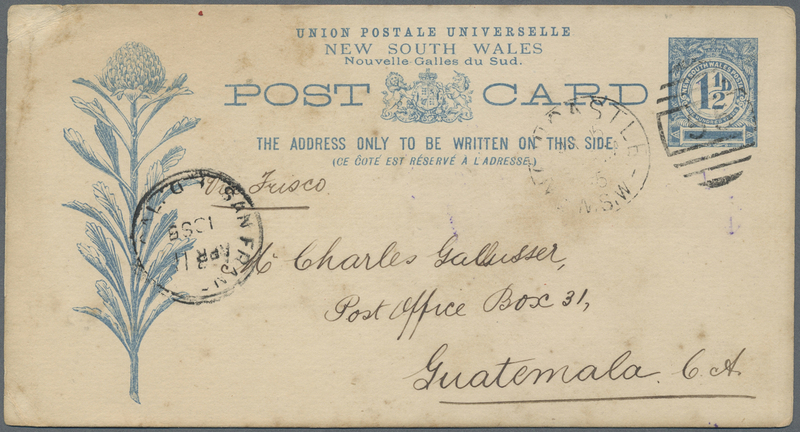 80068 Ganzsache (Complete) Ascher 12 1894, UPU stationery card 1 1/2d on 2 d cancelled with MELBOURNE duplex sent vi London to Guatemala. Very rare destianation. 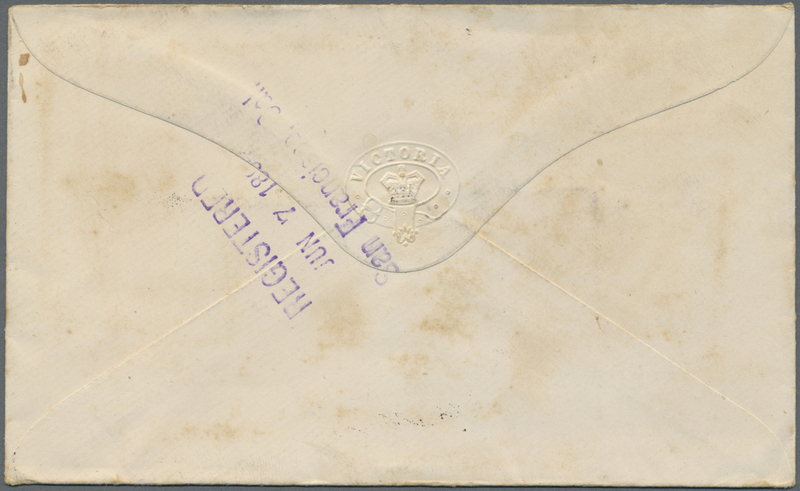 80069 Brief (cover) 1913, mixed franking 1/2 d Victoria and 1 d kangaroo, Australia on ppc "Postoffice Camperdown sent with duplex "TERANG VICTORIA/254" to Lima, Peru. 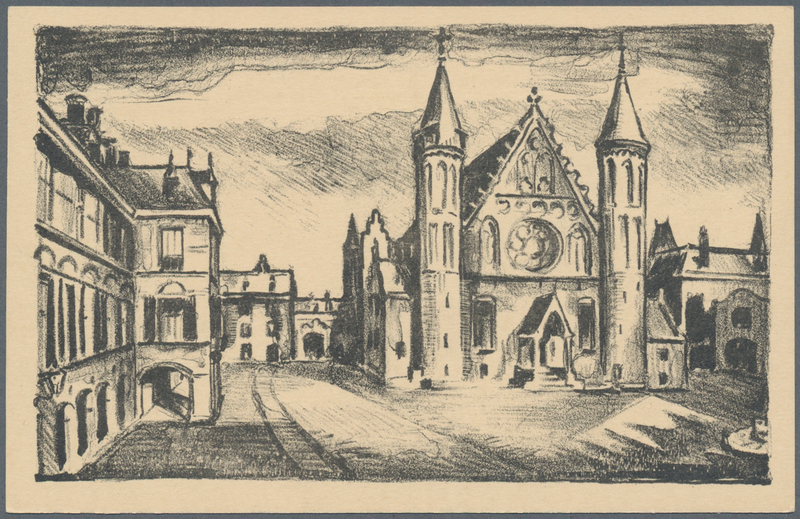 Rare destination. 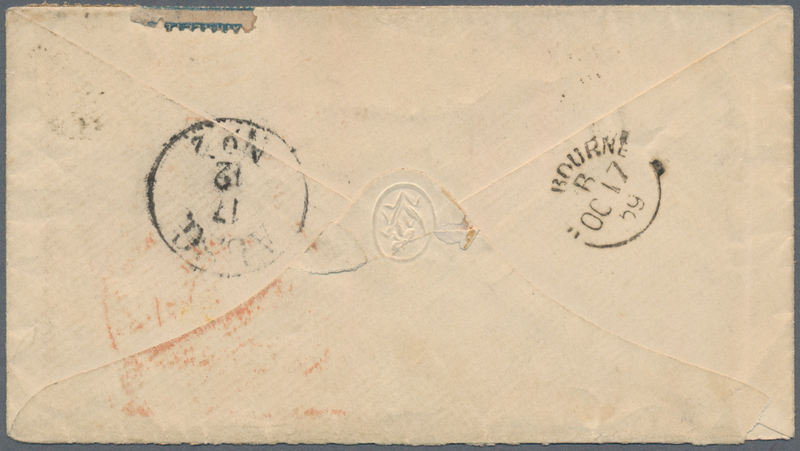 80070 Brief (cover) 218, 220,243+P36,37( 1945, Registered luggage-label bearing 3,50 Fr and 10 Fr cancelled "MATADI 31.10.45" sent to Belgie with due stamps 1,50 fr. 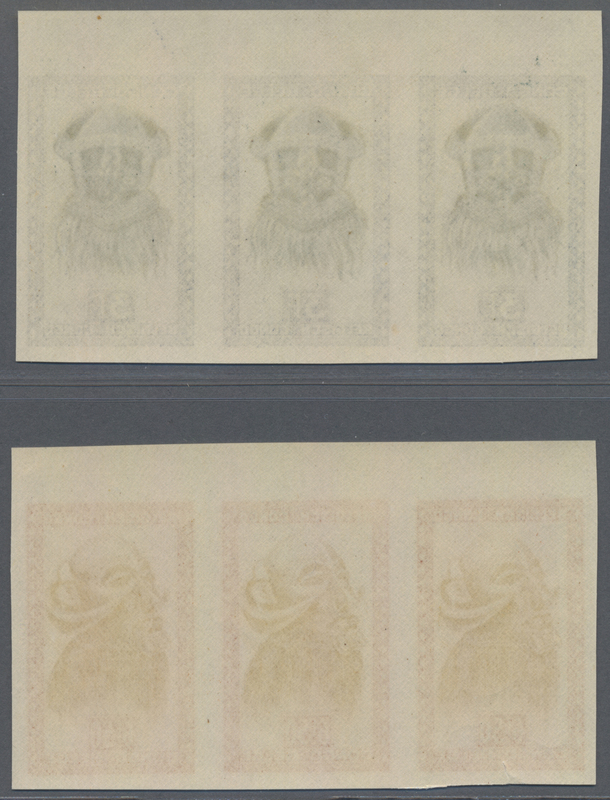 and pair of 2 Fr cancelled "ST. NIKLAAS 9.11.45"
80073 ungebraucht ohne Gummi (unused without gum) (*) V 24 F 1931, "R / Rs. 400" on 1300r. 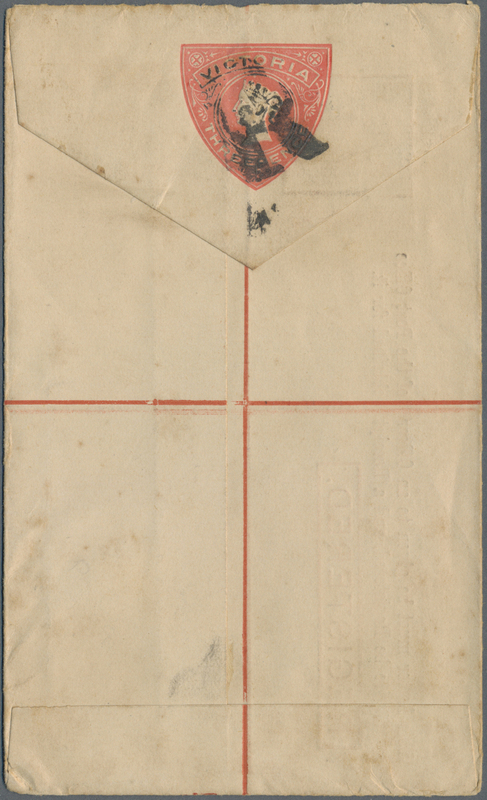 green, VERMILION surcharge in cursive letters, fresh colour and well perforated, unused no gum. 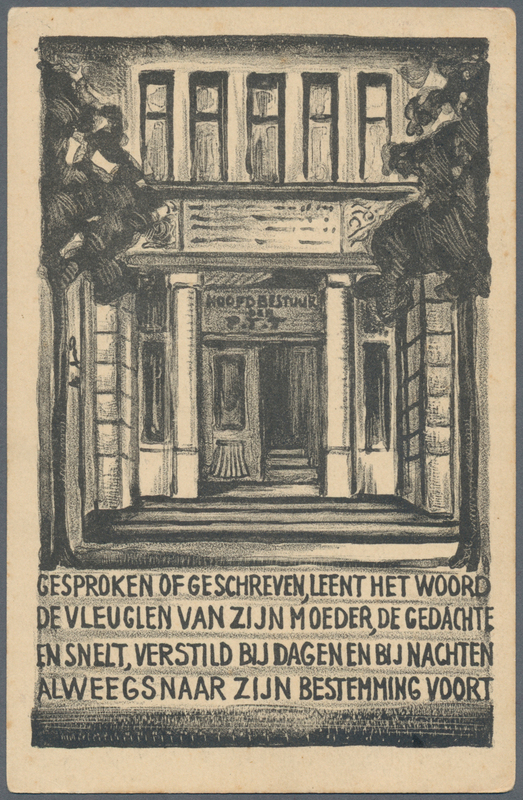 RHM V-15A. 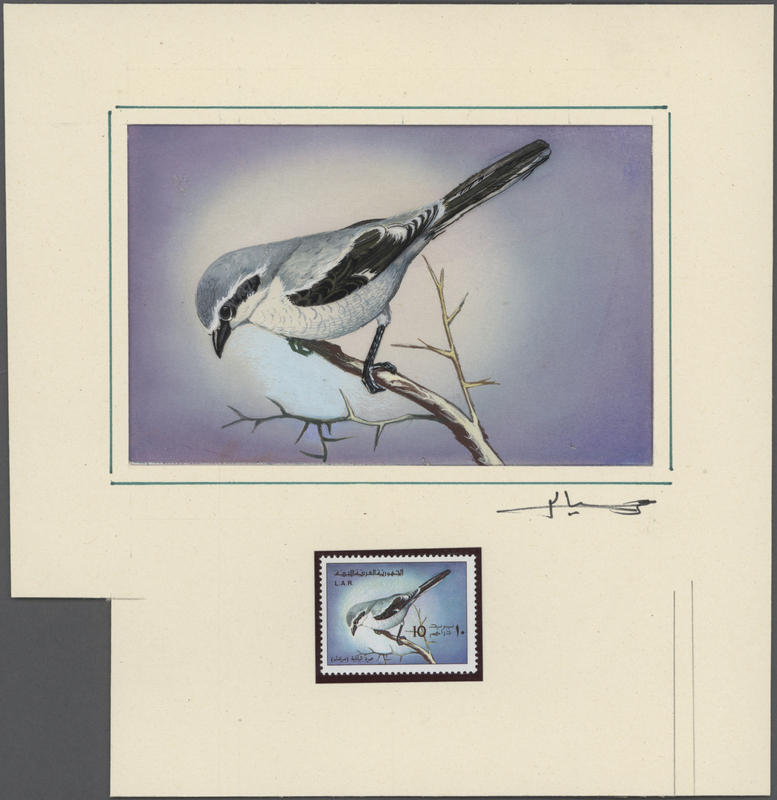 Very rare stamp! 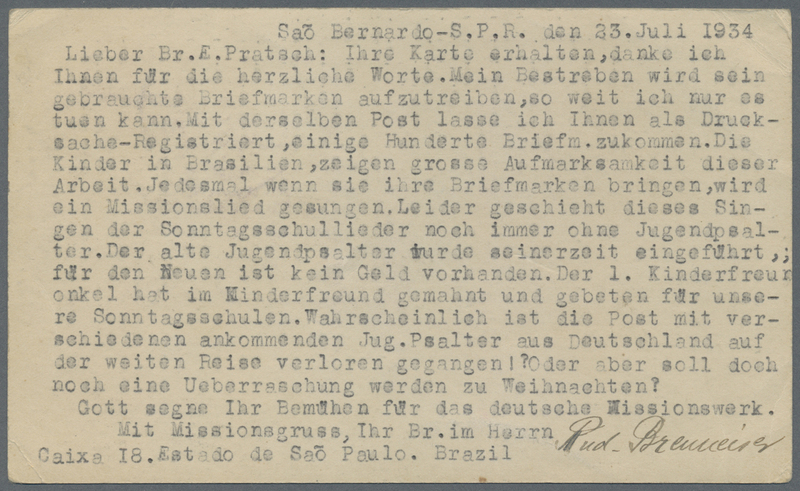 80074 Ganzsache (Complete) H&G 44, 217 1934, 100 R. stationery card uprated with 300 R definitive from "SAO PAULO 23. 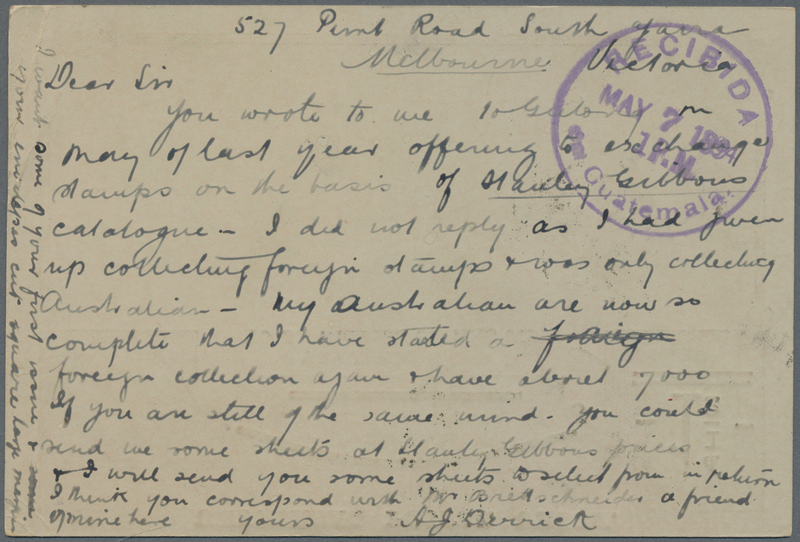 VII 34" to Germany. 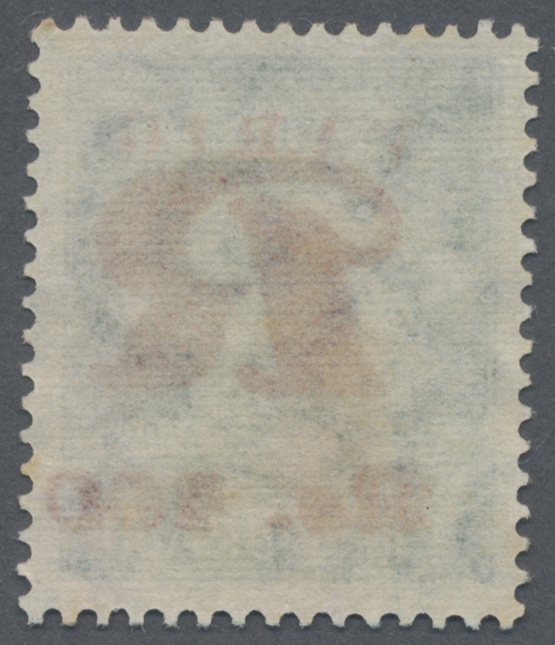 80075 Ganzsache (Complete) 1902. 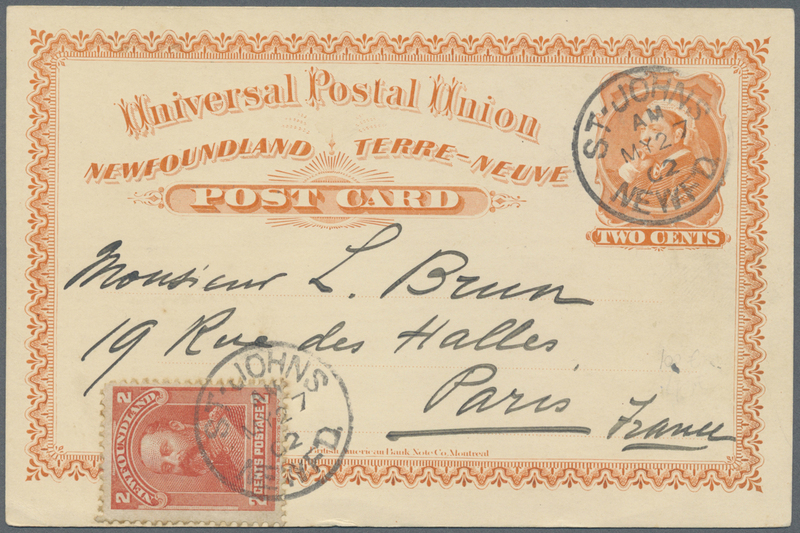 Newfoundland postal stationery card 'two cents' orange upgraded with SG 86, 2c orange tied by St John's date stamp addressed to Paris. Very attractive item. 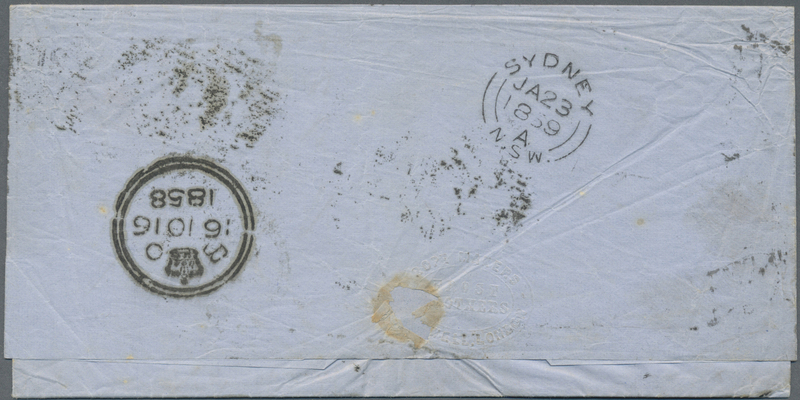 80076 Brief (cover) 323-35A 1938, Royal Family 2 C to 7 C perf. 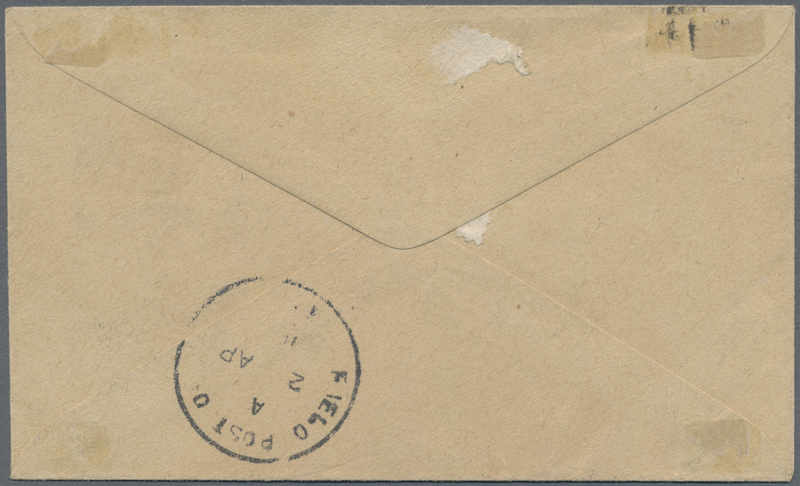 K 13½ on registered letter sent from "ST.JOHNS MAY 19 1938" Chicago, USA with arrival 23.5.38. 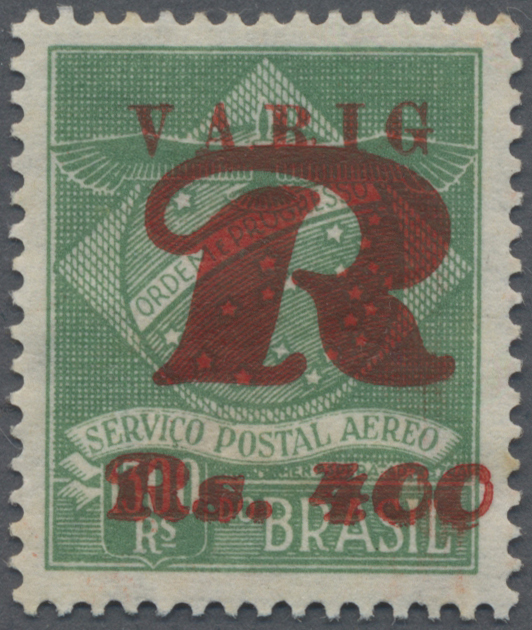 80077 ungebraucht (hinged) * SG 191 1930, 36 c. sage-green with overprint "Trans-Atlantic AIR MAIL By B.M. 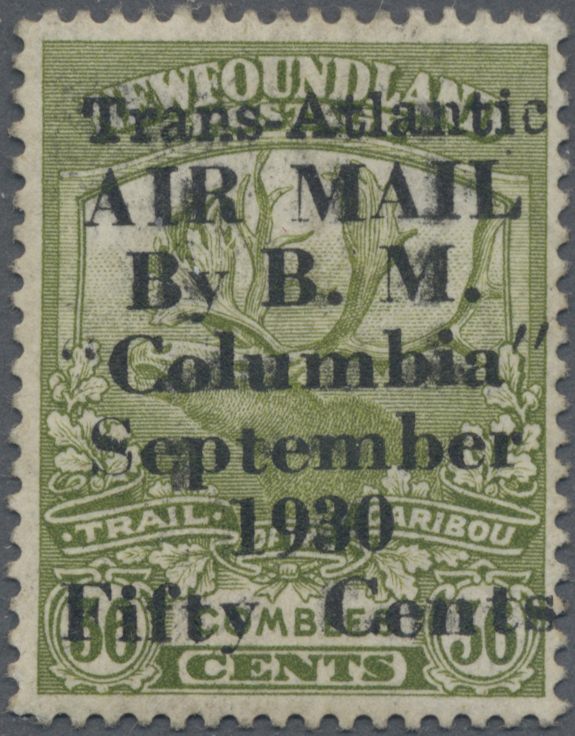 "Columbia” September 1930 Fifty Cents”, unused, certificate Scheller, very fine, scarce!